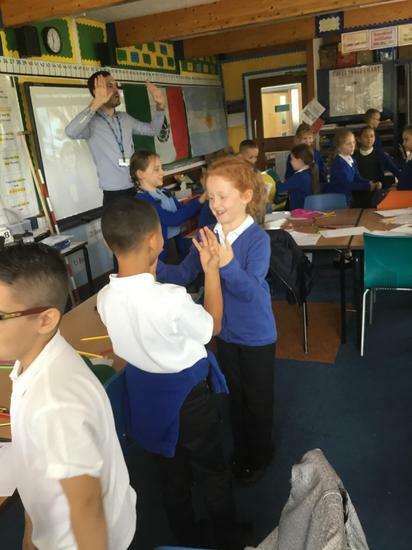 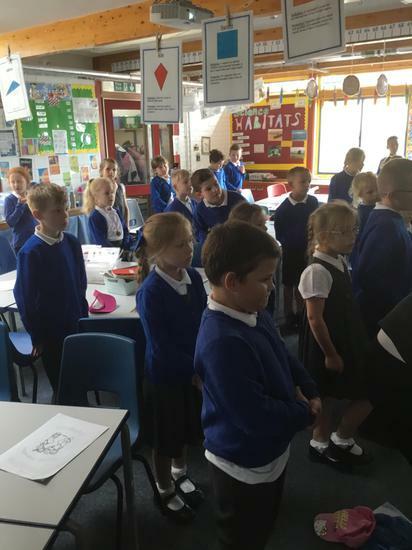 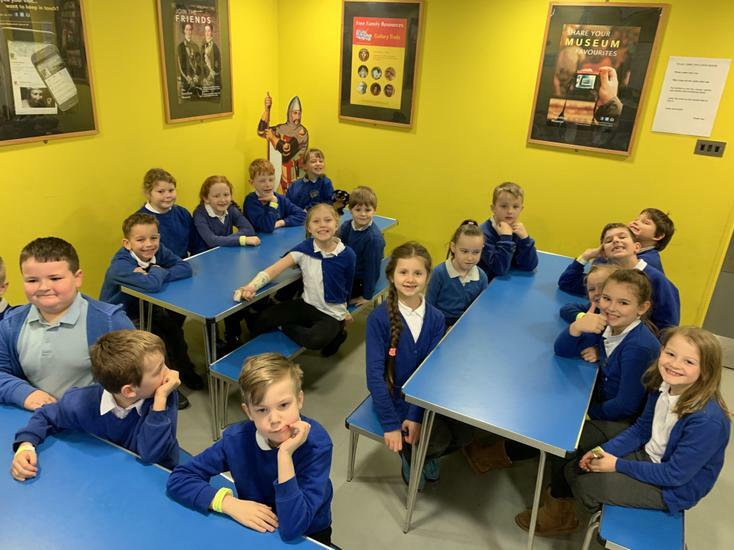 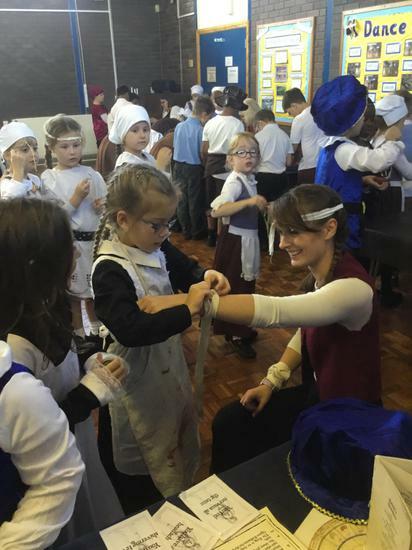 The class teacher for this year is Miss Wanless. 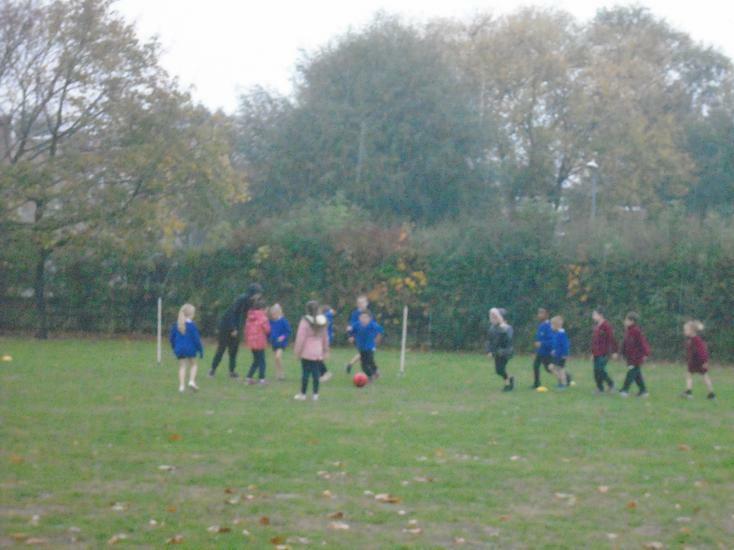 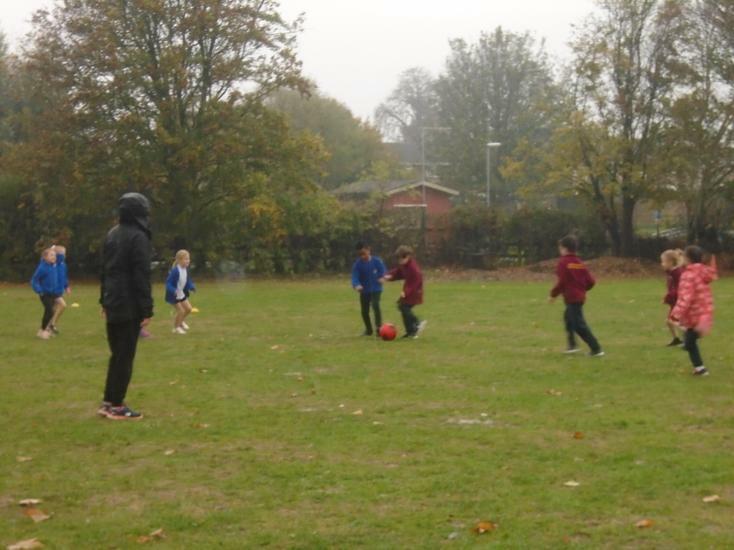 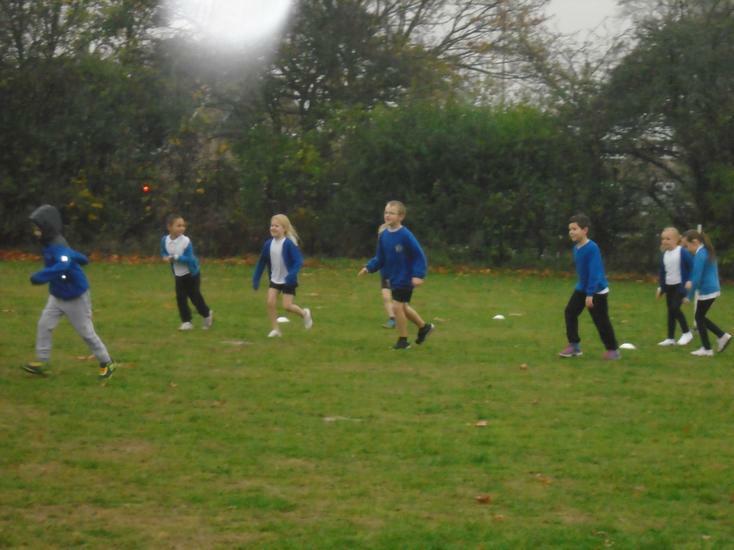 The children will have PE on Monday afternoons but they must have their PE kits in school all week. 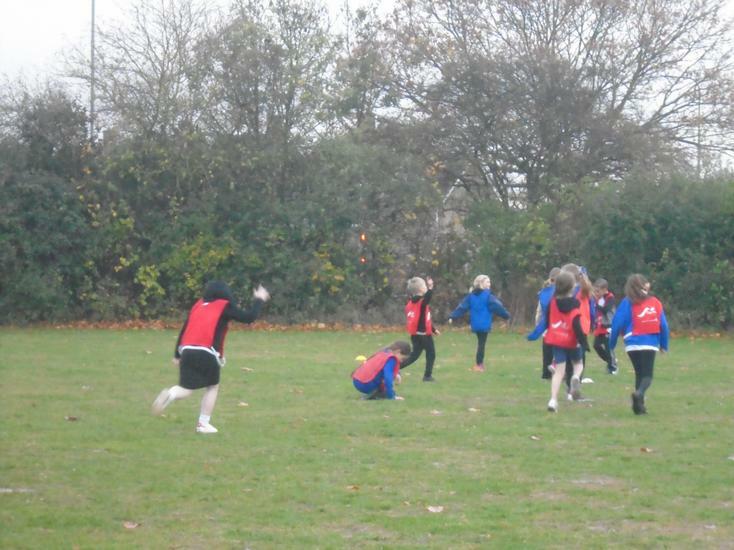 Please ensure your child has a water bottle, a sun hat, wellies and appropriate clothing for the unpredictable weather! 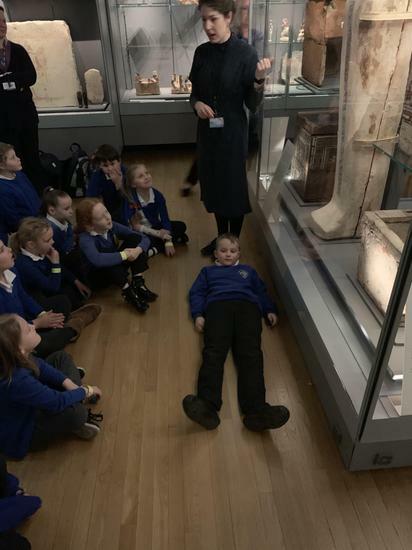 The children have been amazed by this story. 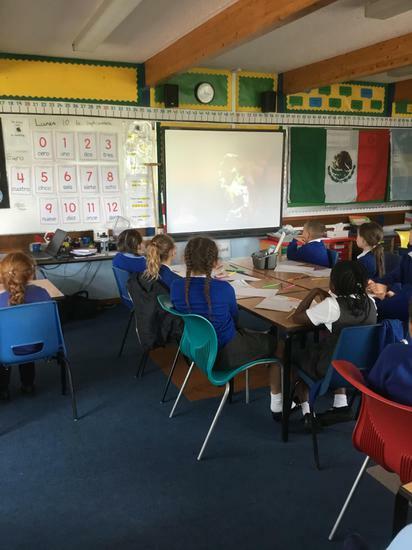 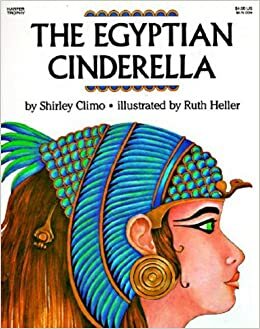 So far they have compared the Egyptian Cinderella with the original fairy tale, they have inferred how a character is feeling and they have identified verbs in the pharaoh's journey. 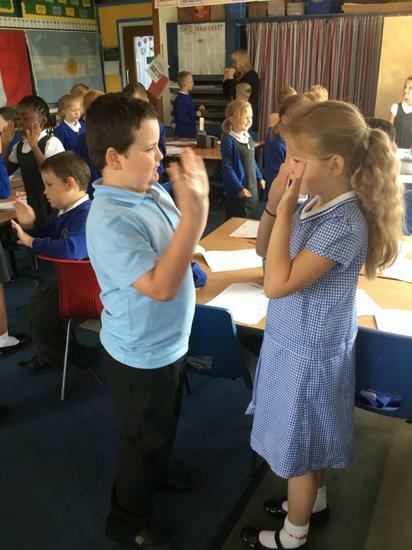 We will be moving onto debating the good and parts parts of the characters life as a class and then writing our own stories! 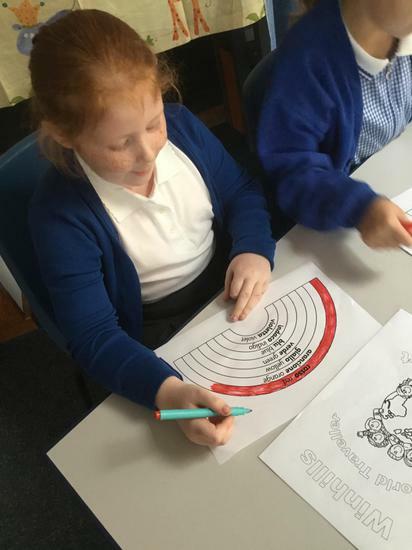 In Maths, the children have been learning about money. 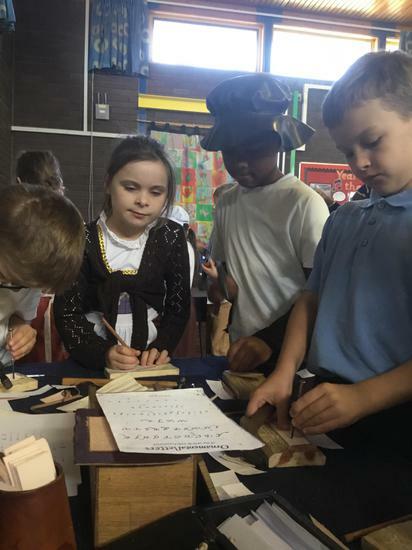 They have identified the different values, converted pounds and pence and added and subtracted money to find the totals. 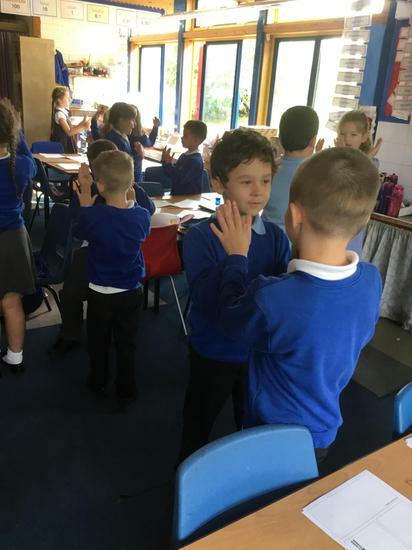 We are now moving onto time in which children will have to tell the time to the minute and learn about the days, months and year. 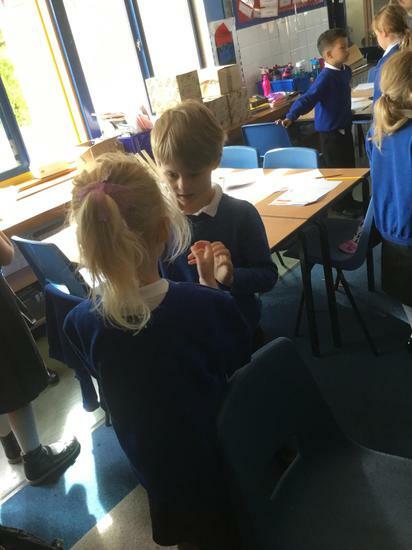 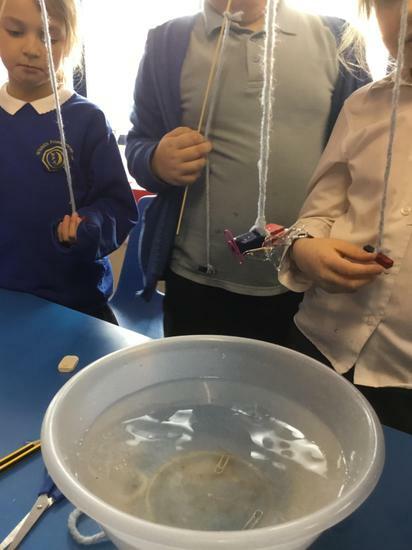 In science, the children have been learning about light, reflection and about how light travels. 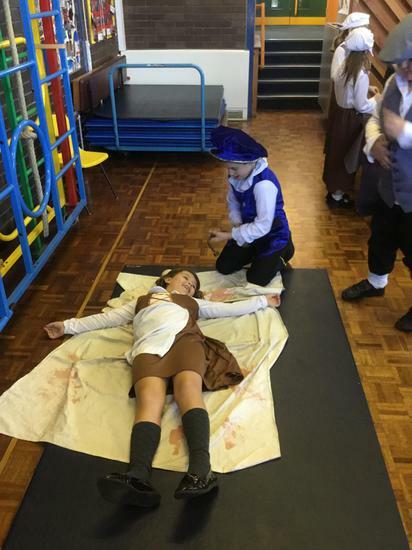 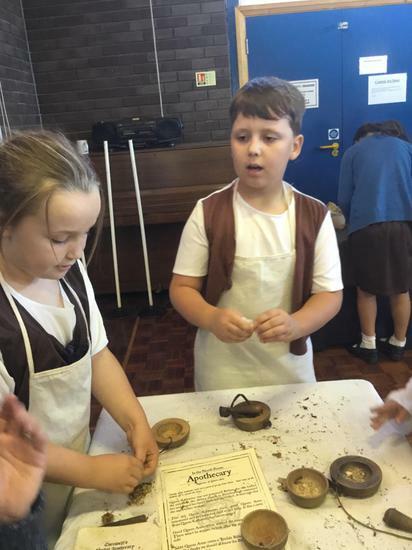 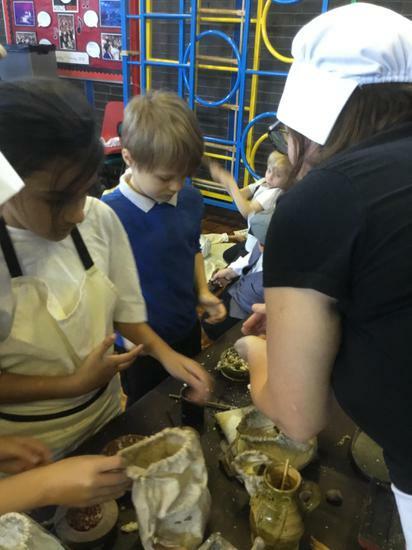 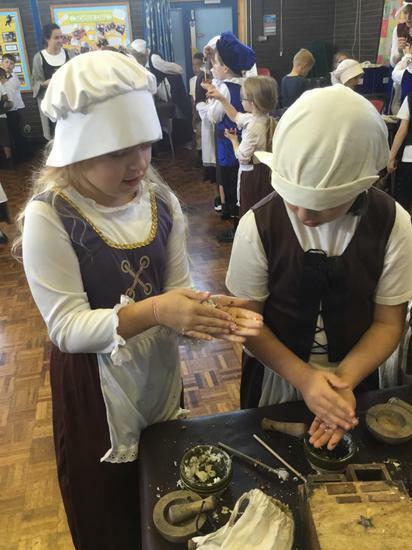 The children have thoroughly enjoyed the investigations! 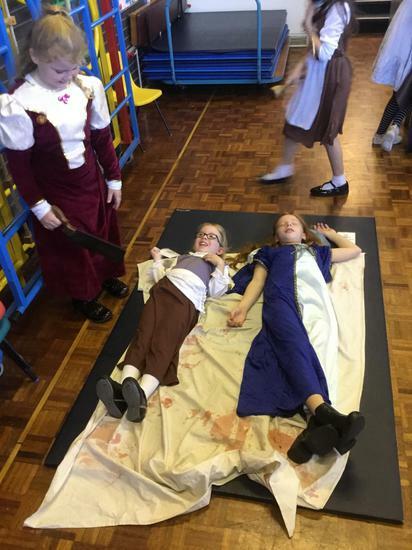 World book day was amazing! 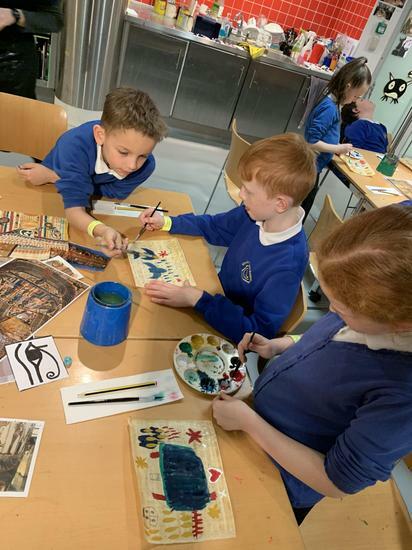 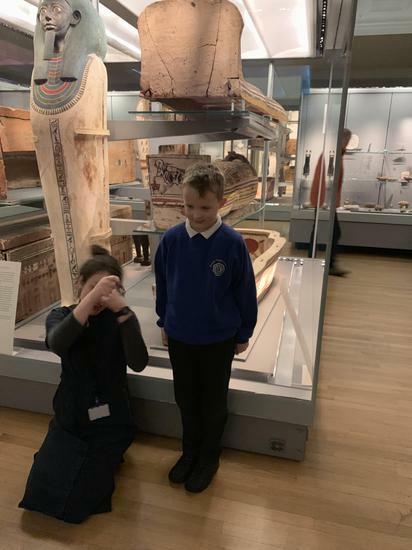 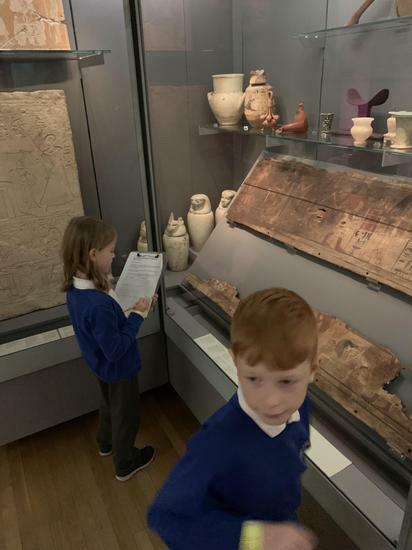 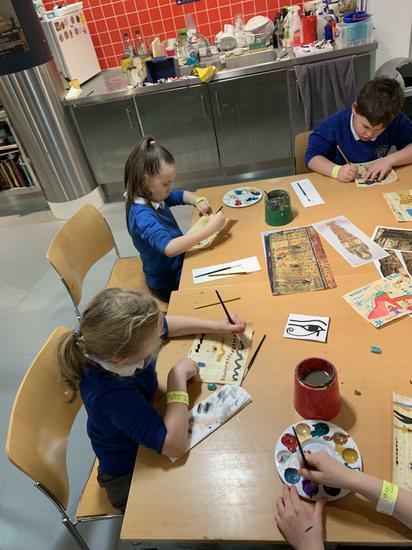 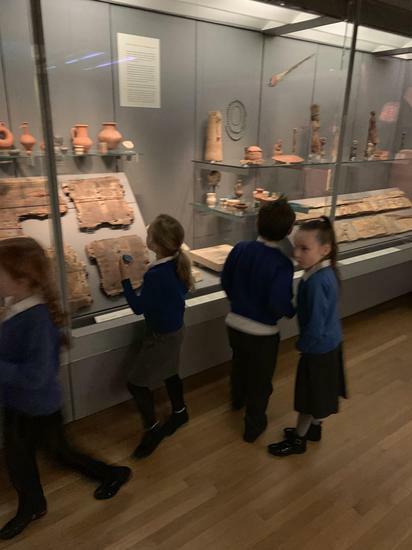 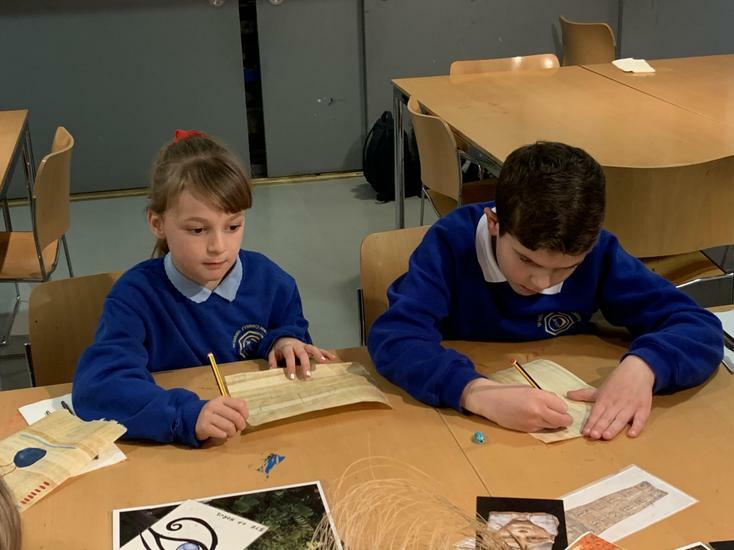 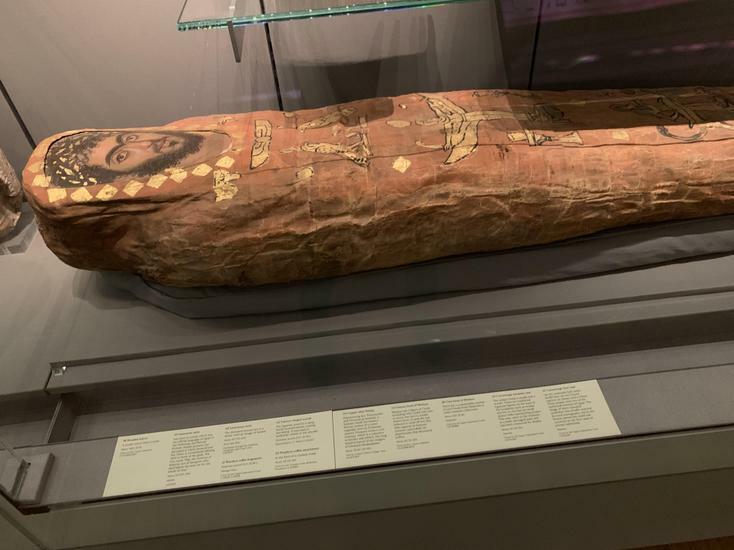 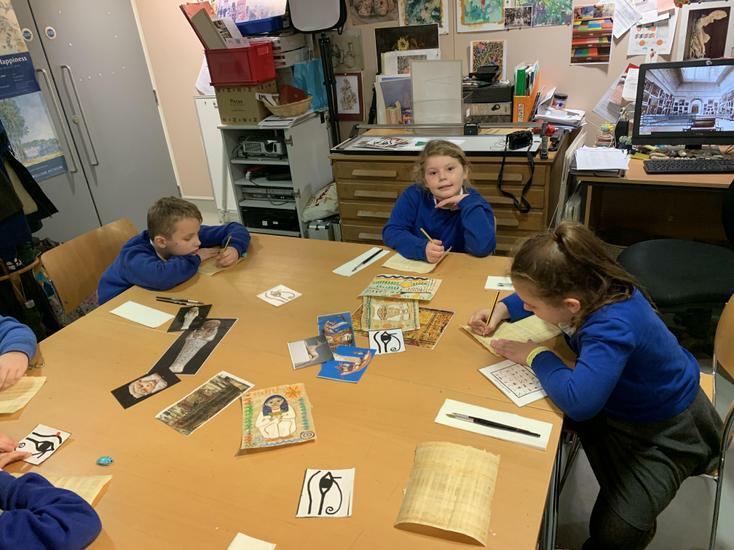 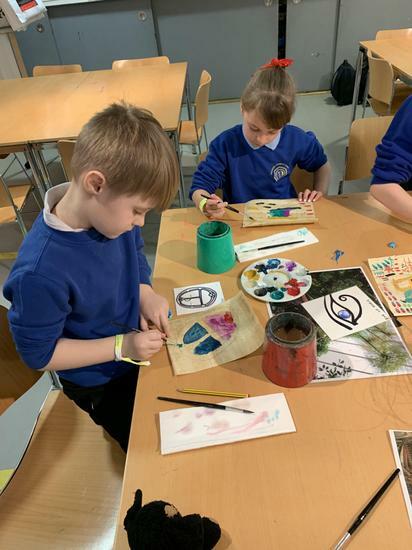 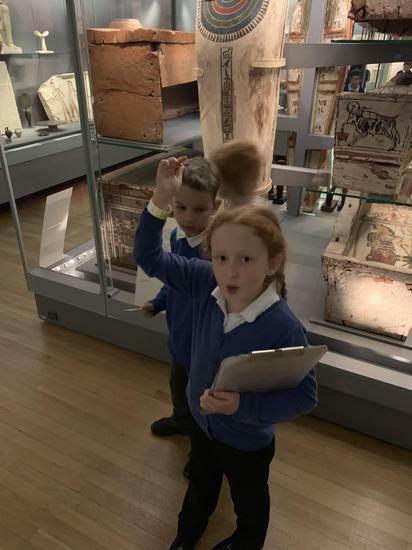 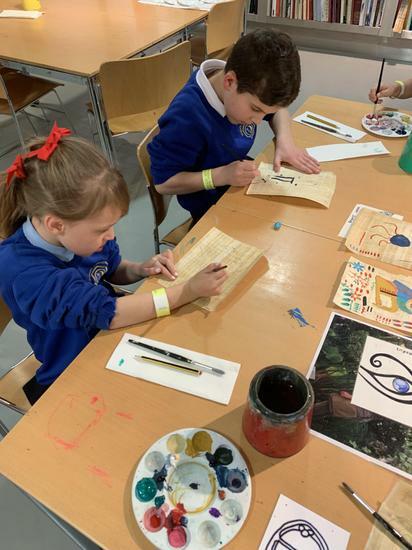 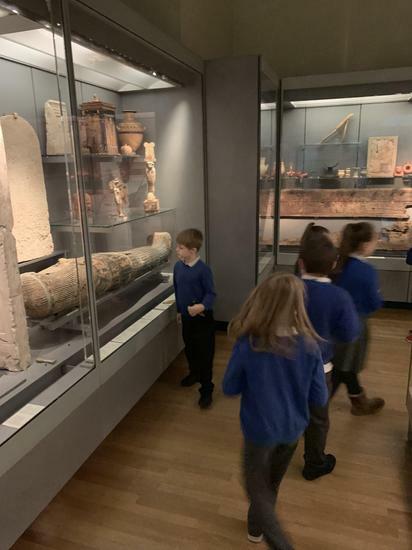 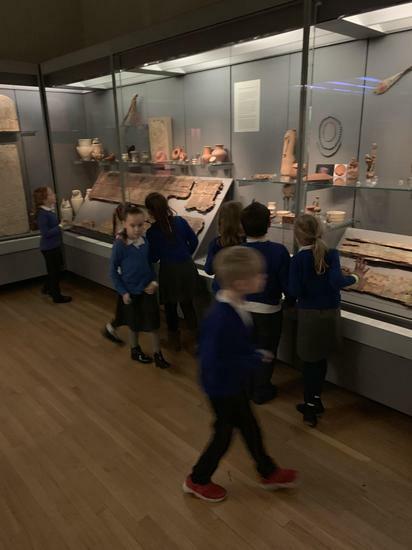 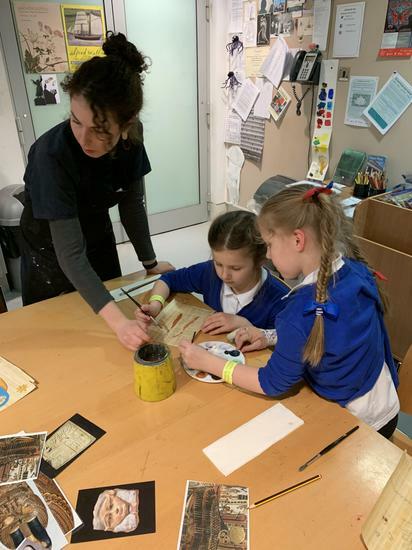 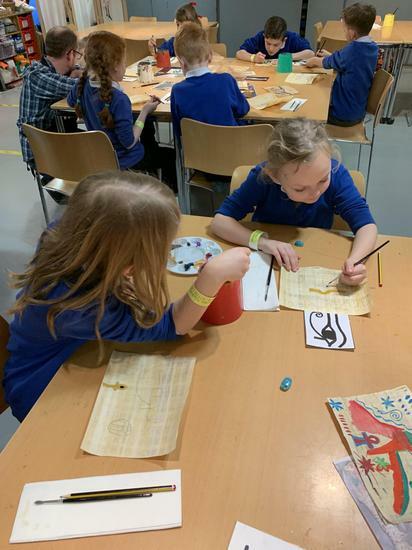 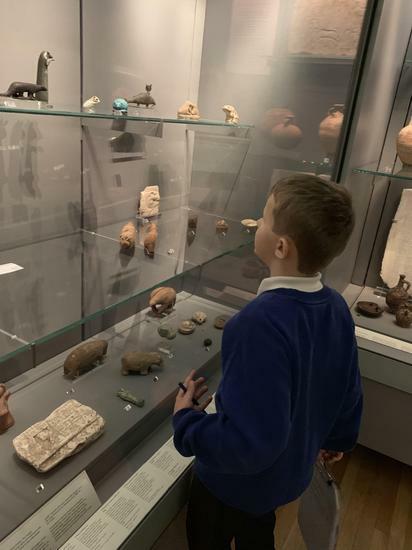 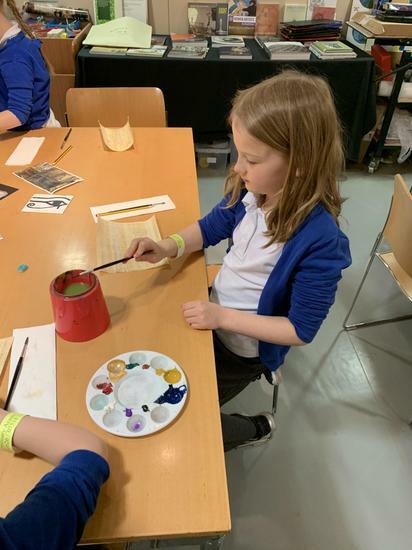 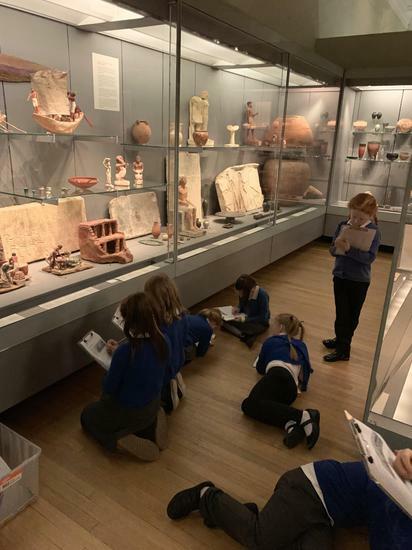 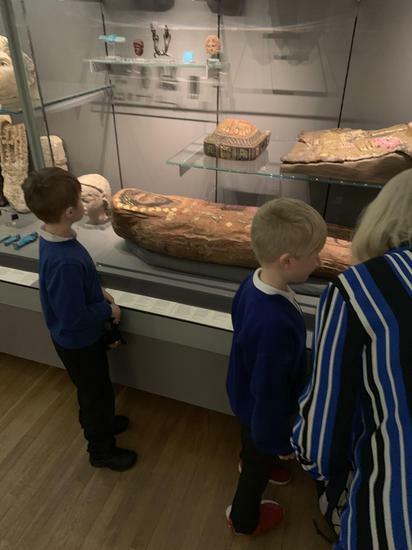 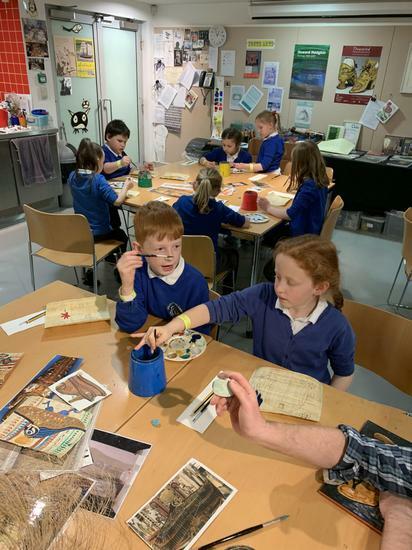 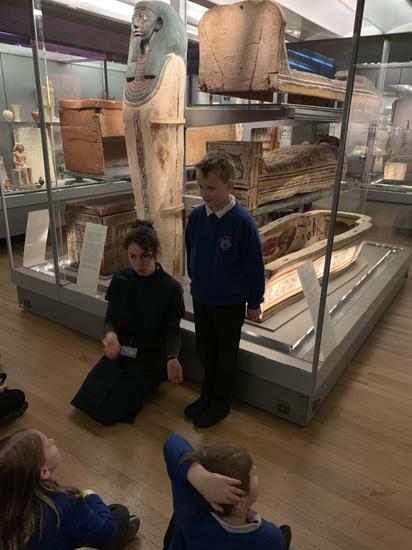 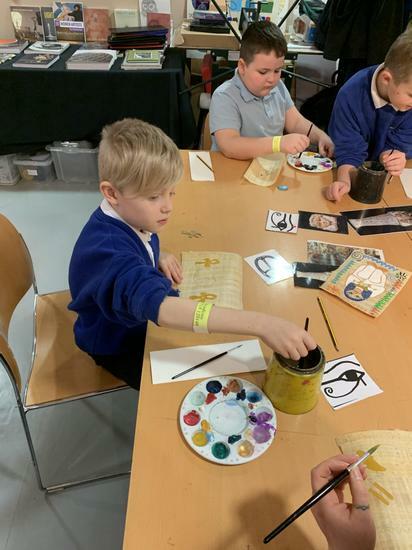 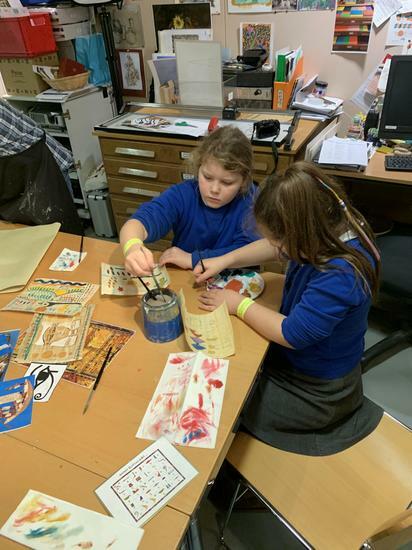 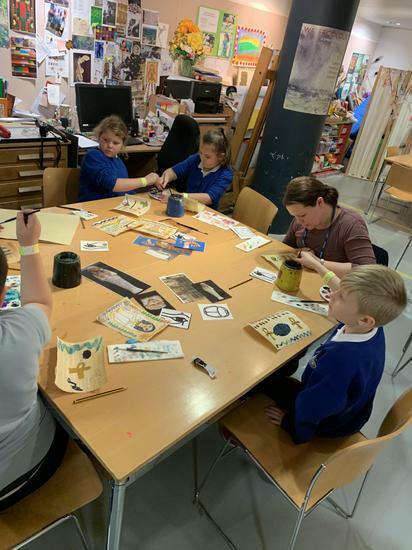 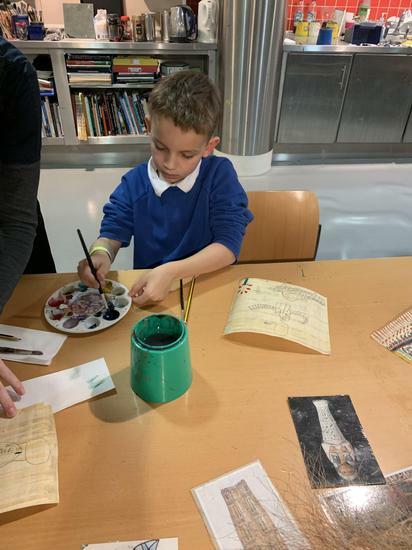 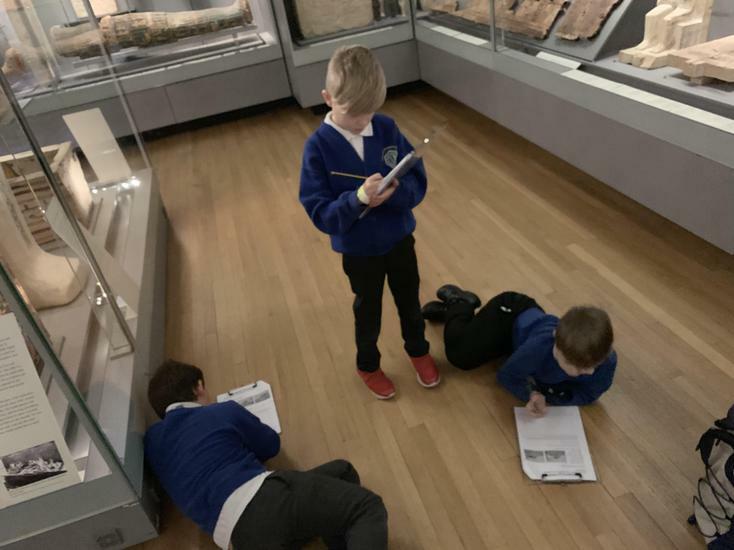 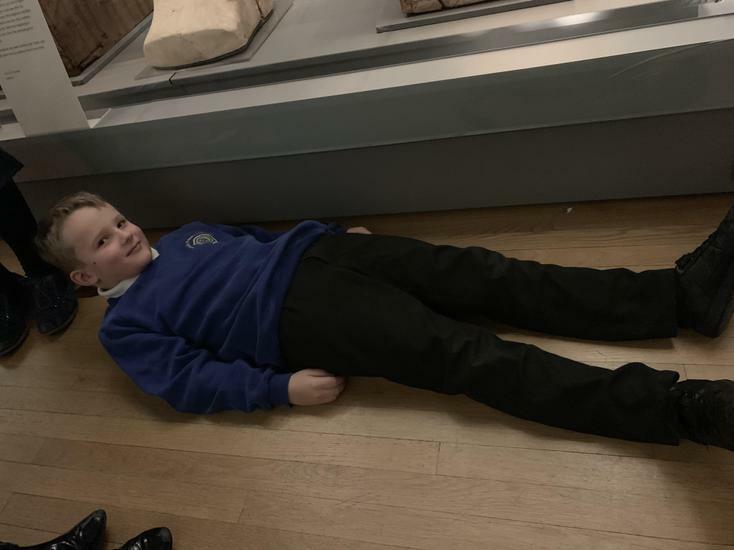 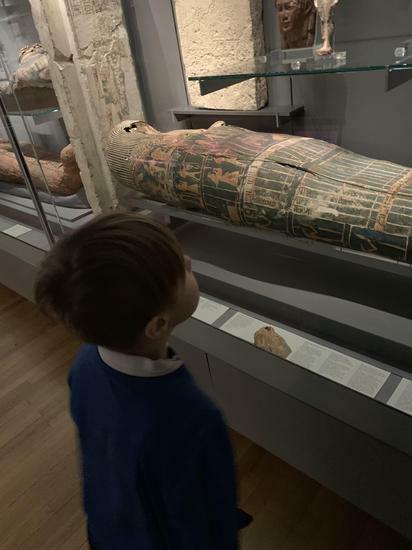 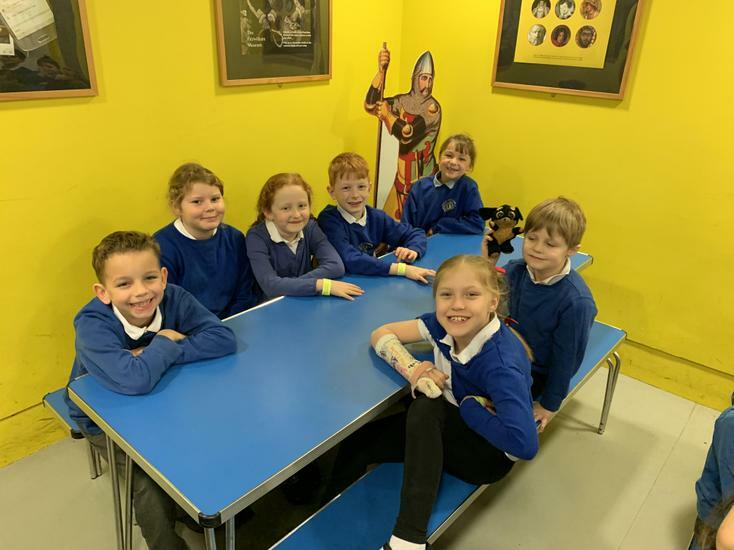 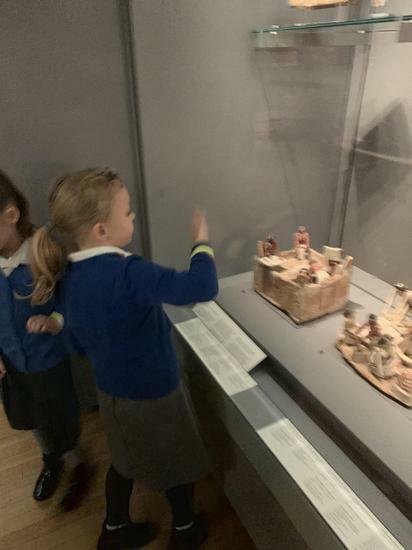 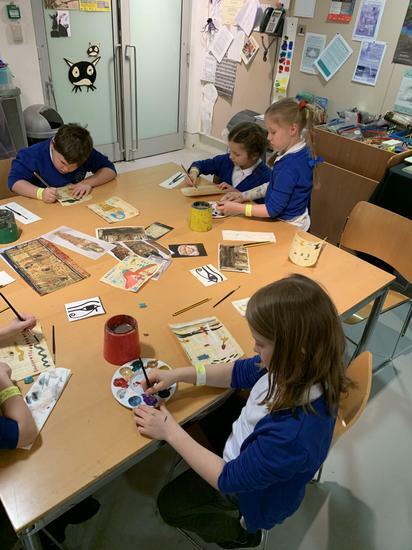 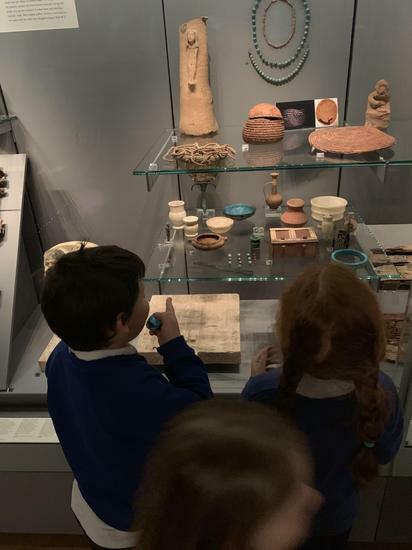 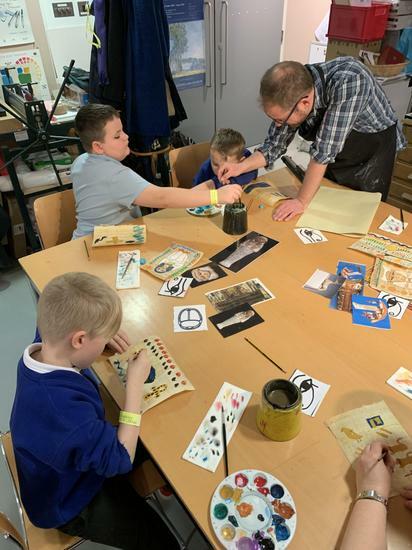 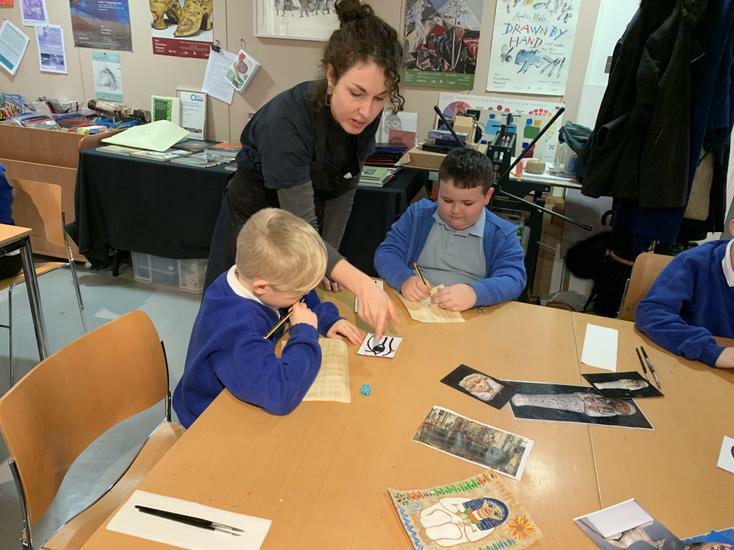 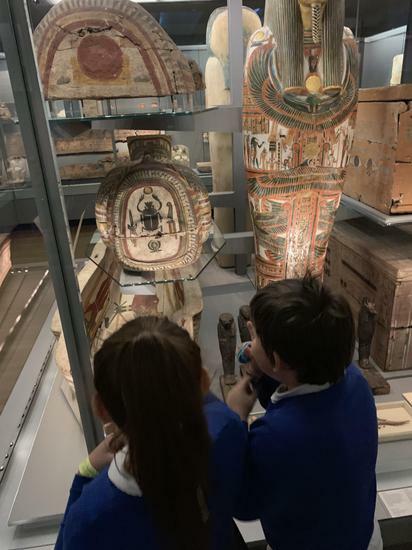 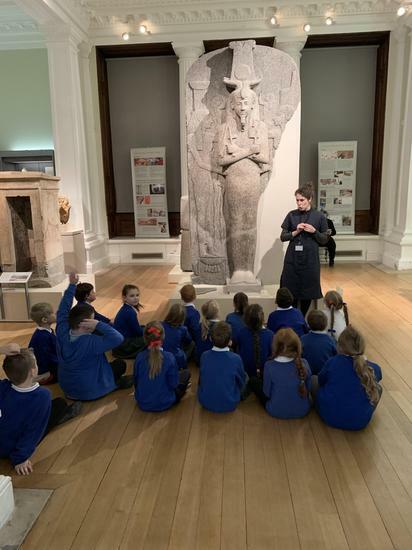 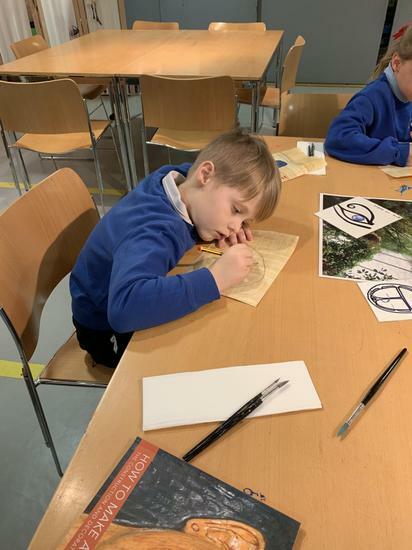 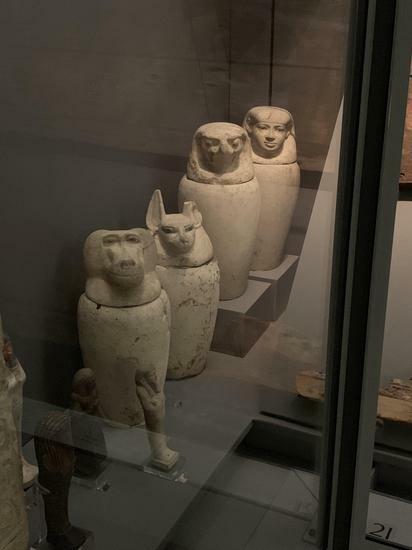 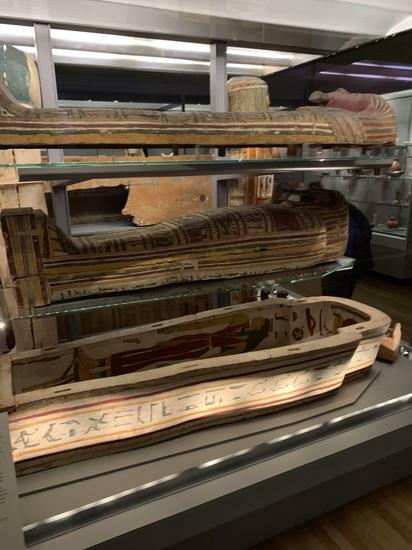 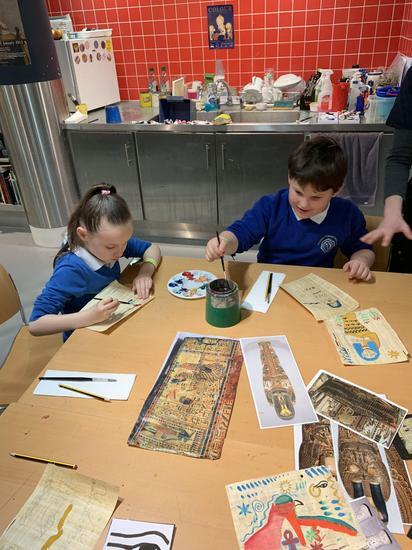 The children had an amazing time at the Fitzwilliam museum (see pictures below). 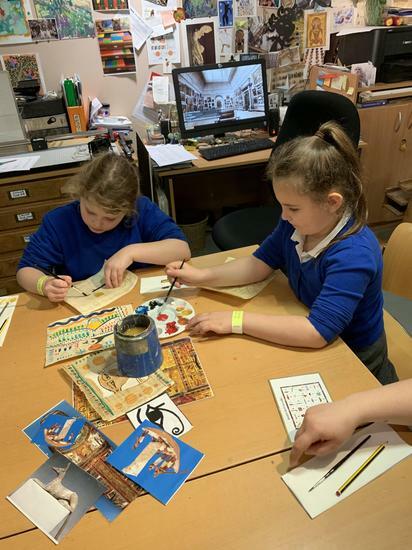 They listened well, discovered some amazing facts and made their own pictures with papyrus paper. 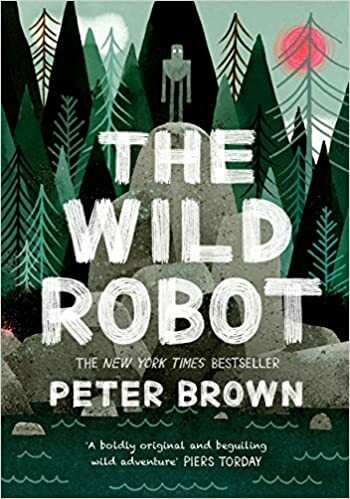 The children are still thoroughly enjoying the story 'The Wild Robot'. 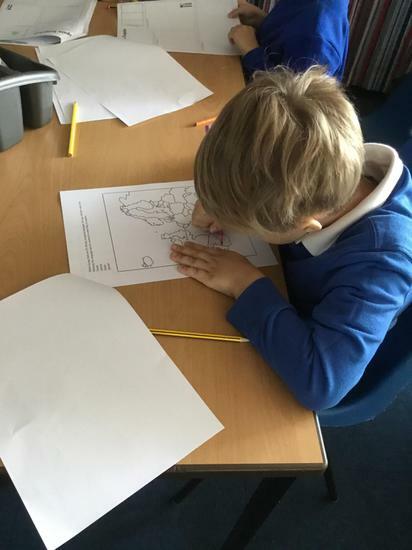 We have read a very exciting chapter about a fire breaking out on the island. 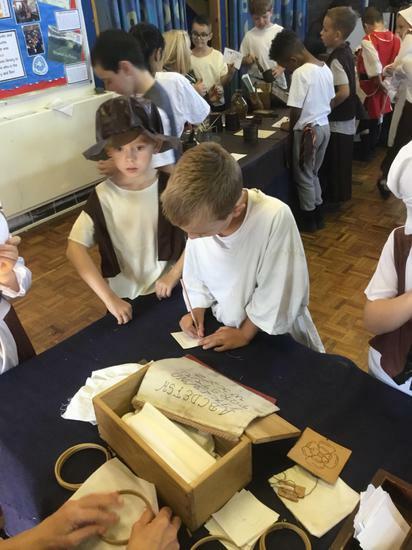 The children created amazing adverts and wrote very emotional diary entries from this chapter. 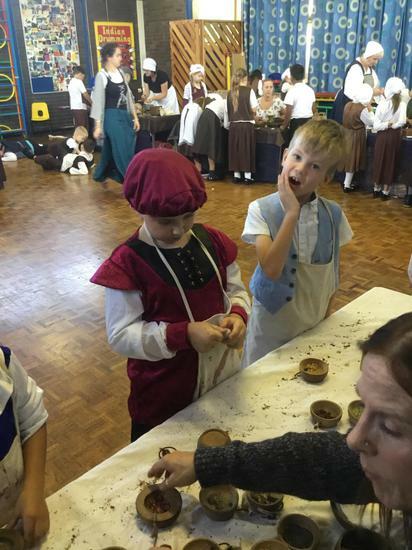 They were extremely eager to find out what happened next! 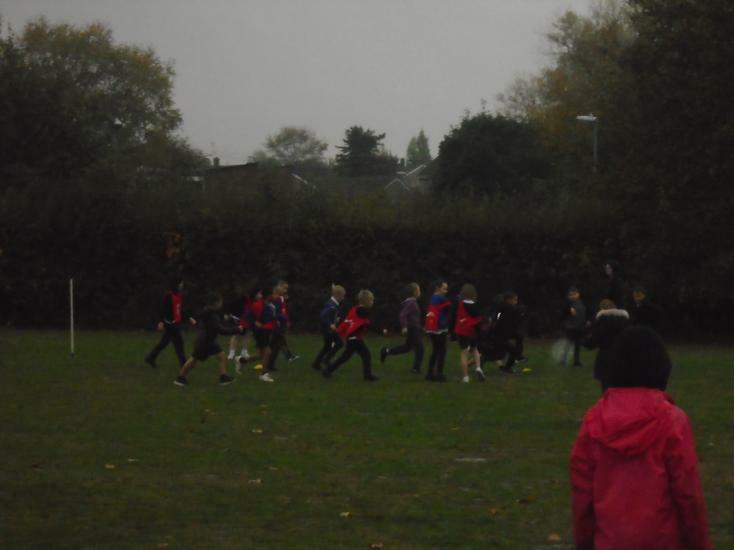 Once we finished the story the children planned and wrote their own sequel 'The Wild Robot Escapes'. 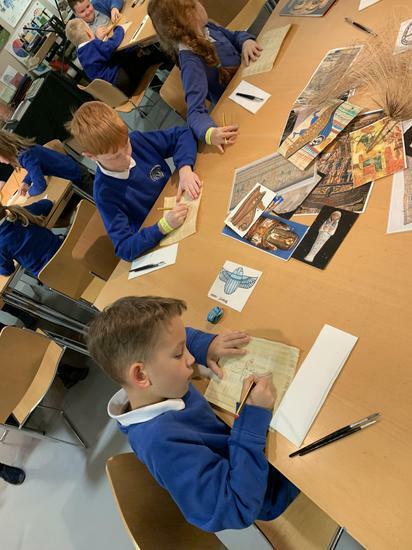 These stories were brilliant and the children are looking forward to reading the actual sequel soon! 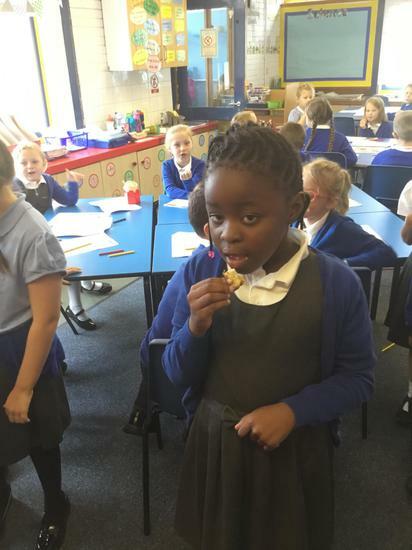 Sapphire have been learning all about fractions and how to add and subtract them. 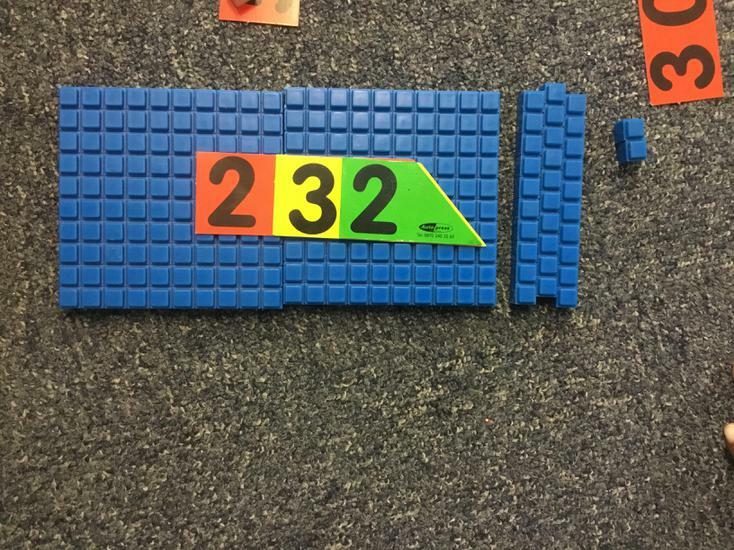 They have really got the hang of finding a fraction of a number. 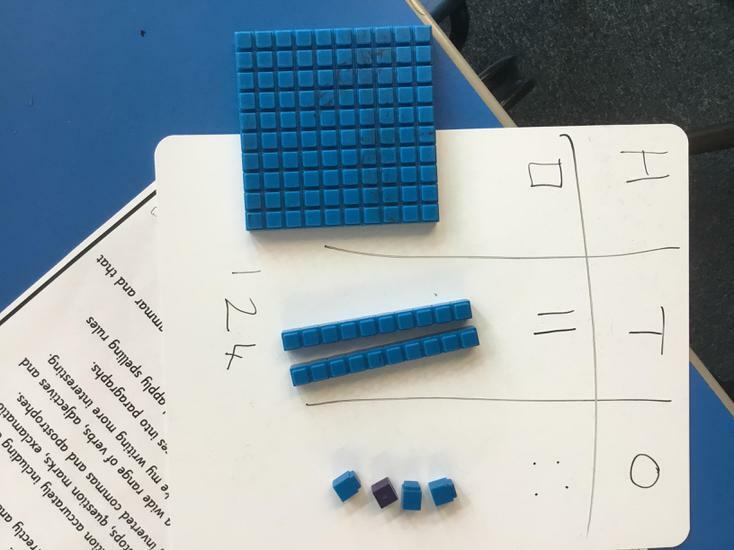 We are now moving onto the 4 operations (addition, subtraction, multiplication and division) and we will continue to develop our written methods. 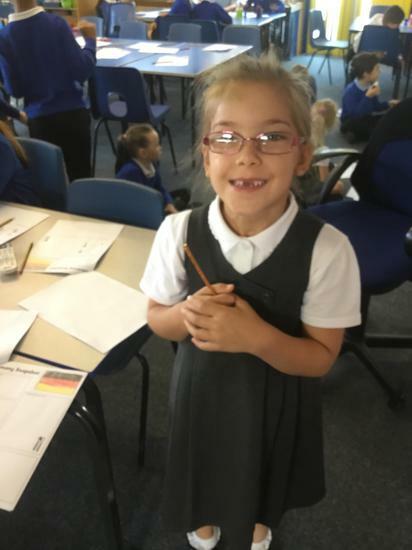 The children have researched their own animals and written fantastic non-chronological reports. 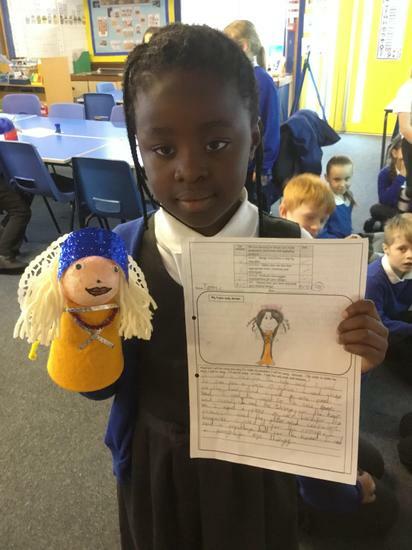 They have also written emails, descriptions and poems using the fantastic vocabulary they have learnt from the story. 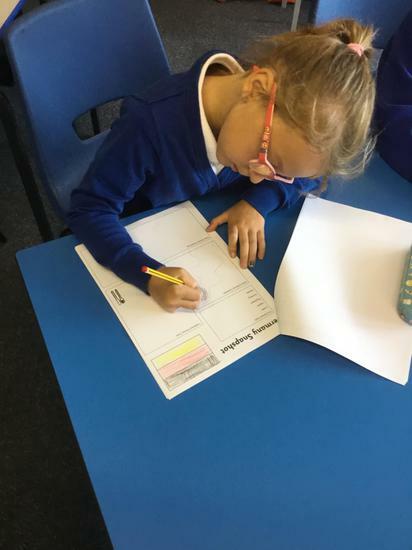 Year 3 have hit the ground running in Maths as they've been recapping their place value knowledge before moving on to our new fraction topic. 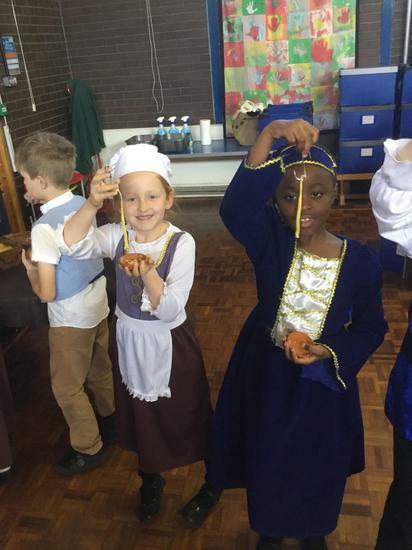 The children have been thoroughly enjoying the build up to Christmas! 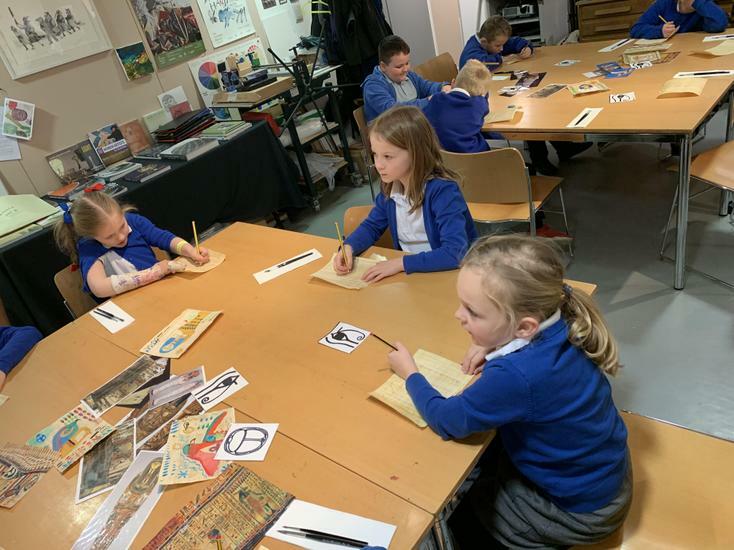 The children have created their own Christmas poems which included acrostic poems, spine poems and when poems. 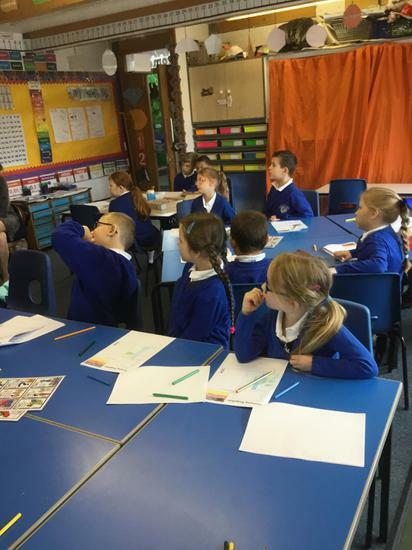 The children focused on rhyme, similes and fantastic adjectives to make their poems as visual as possible. 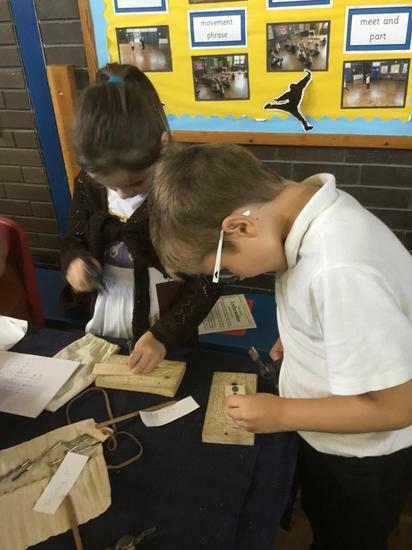 In Maths the children have been enjoying investigations. 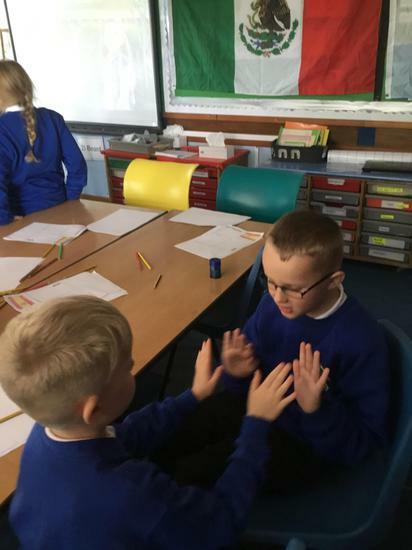 They have worked together to try and figure out all possible answers and explain their reasoning. 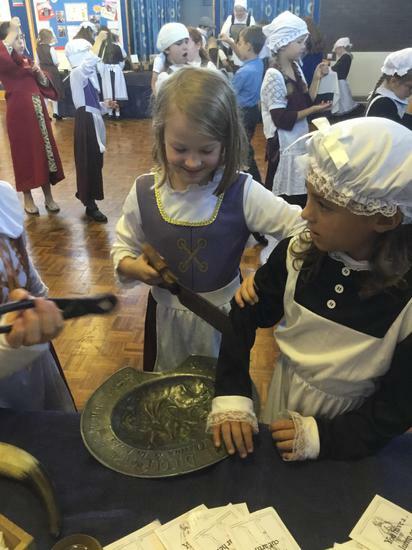 They have found these challenging but enjoyable. 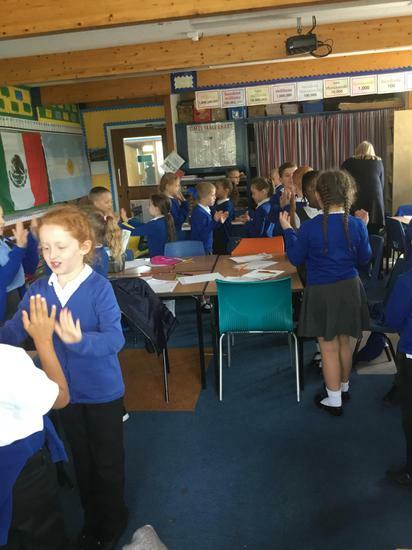 The mathematical language and discussion buzzing around the classroom is fantastic. 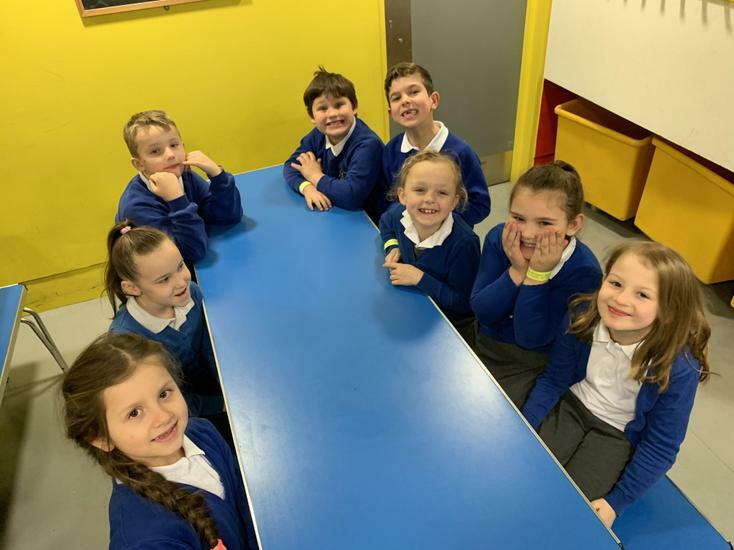 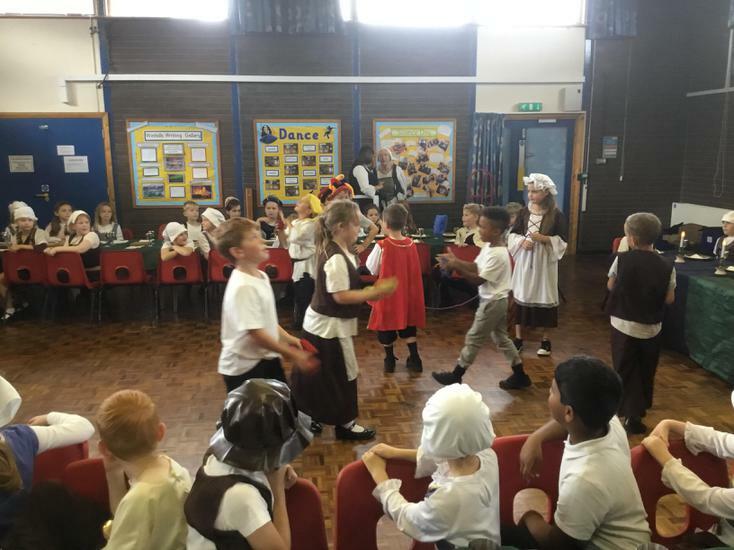 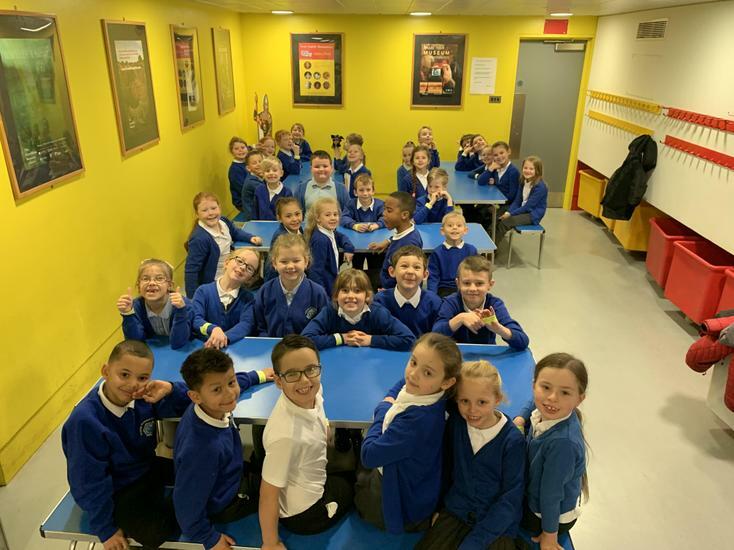 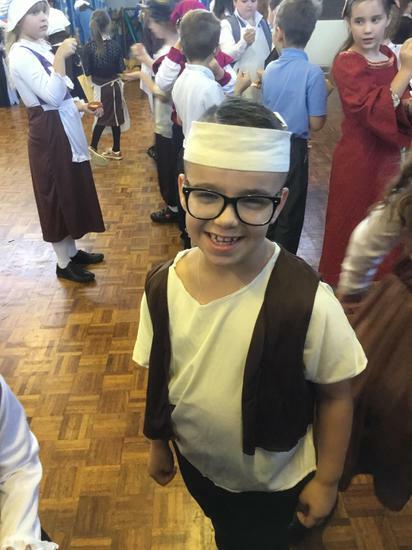 The children have worked extremely hard with learning their dance and songs for the Christmas performance and I know they are very excited to show how amazing they are! 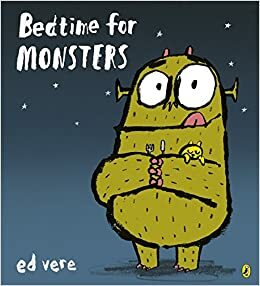 We have started looking at our new text in English 'Bedtime for Monsters'. 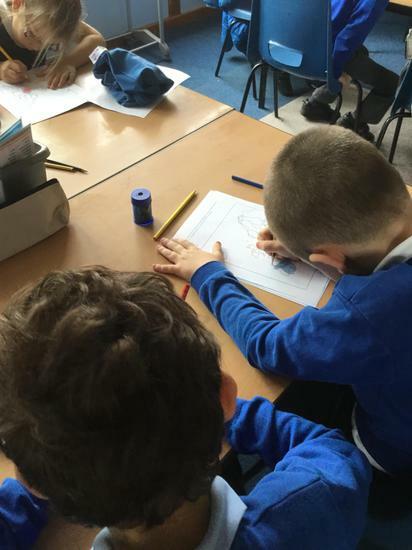 During this text the children focused on word types: adverbs, verbs, nouns and adjectives and used these different word classes when they wrote their own monster story. 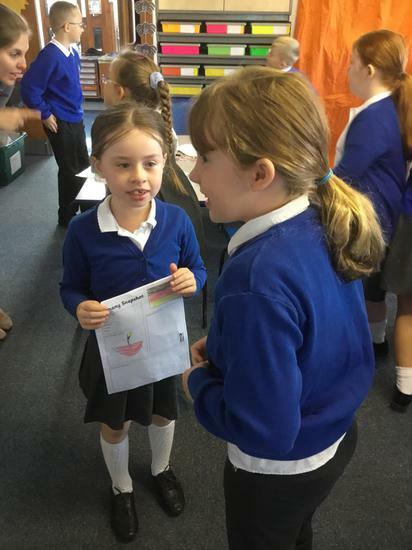 The children also included speech in their stories whilst using inverted commas. 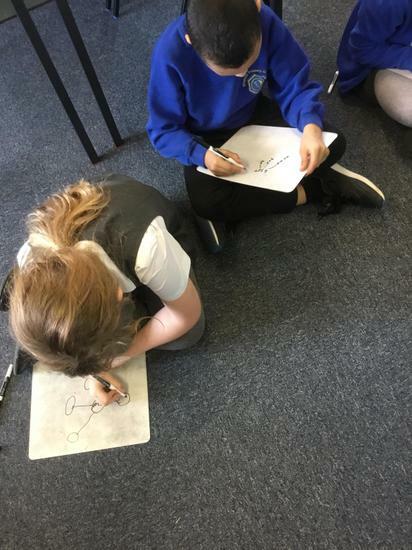 In maths we have moved onto multiplication and division, the children have been working hard to make links between the two operations and are begging to solve reasoning problems based around what they have learnt. 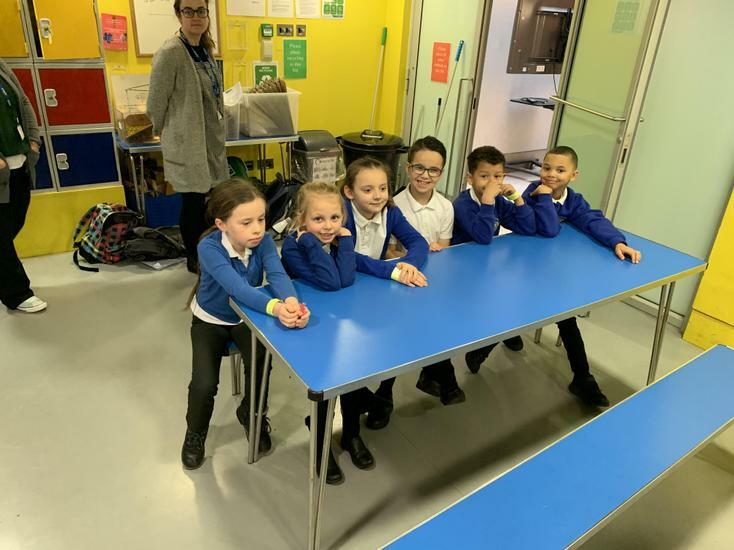 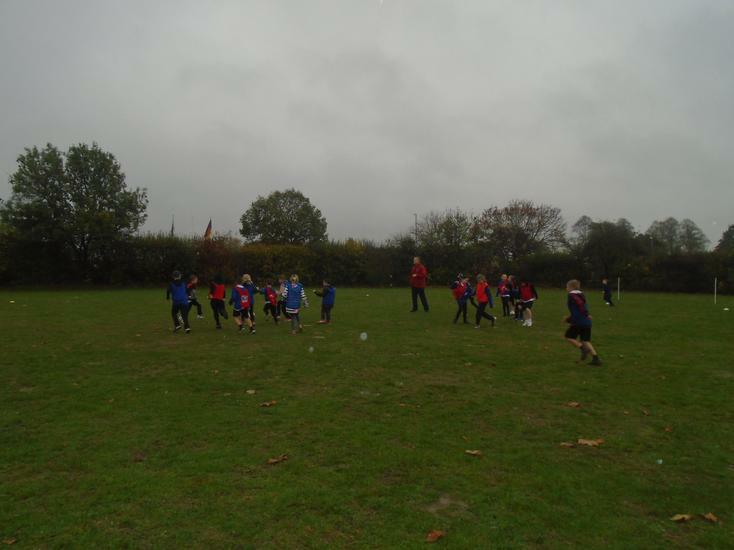 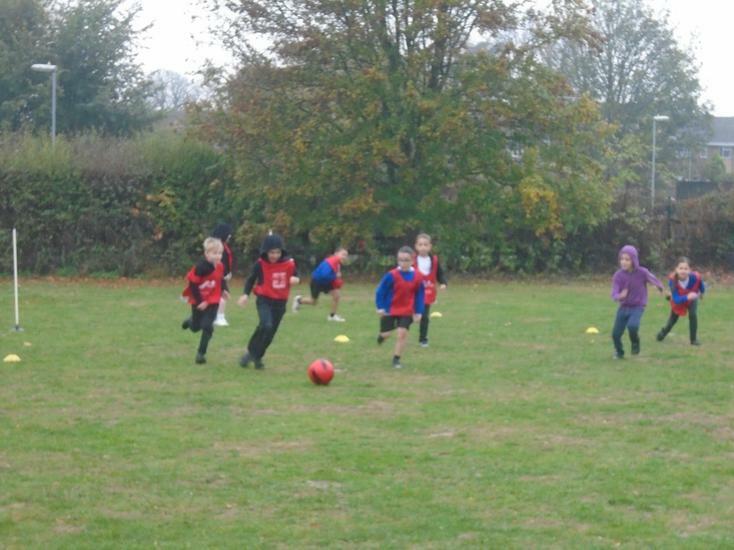 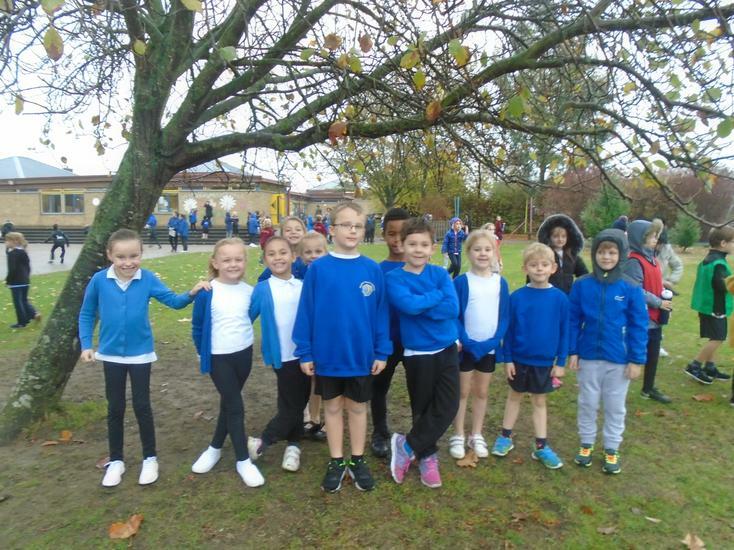 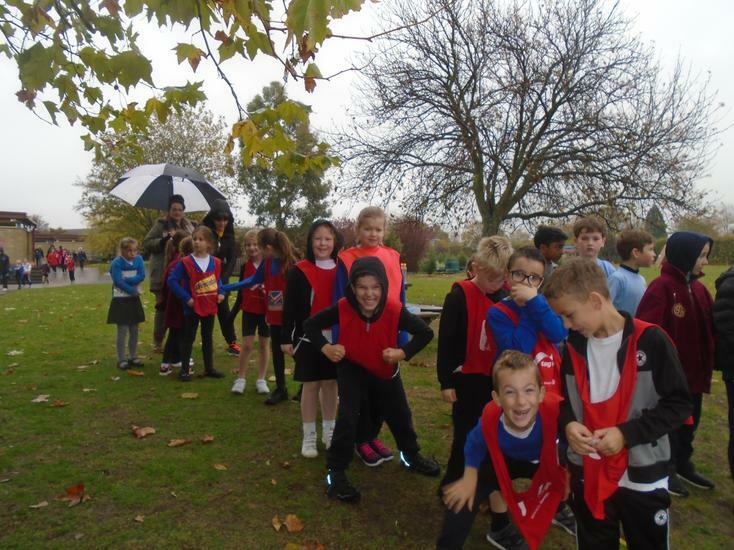 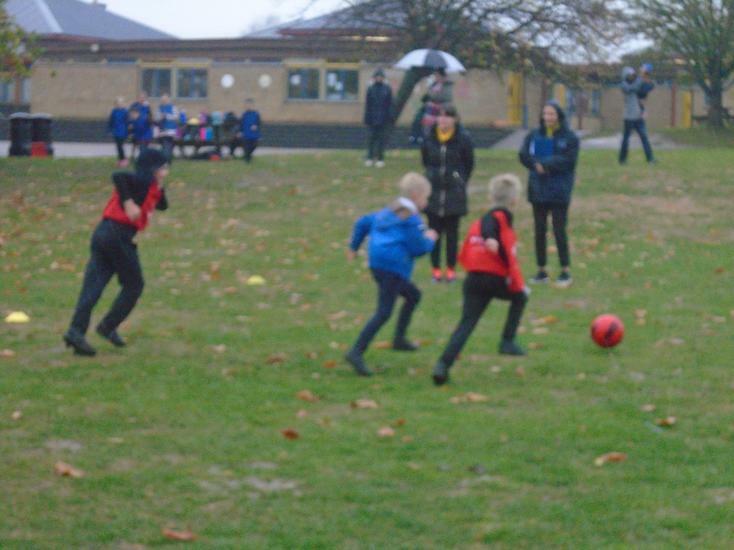 Year 3 DLPT sport event. 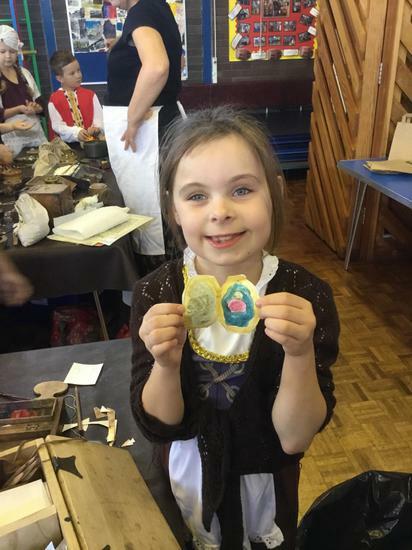 Making poppy wreaths for remembrance day. 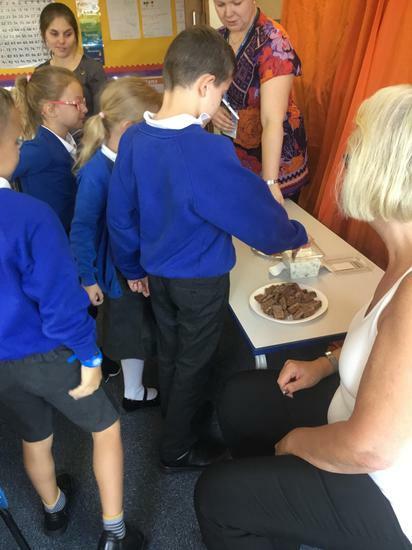 In science we investigated the permibility of soil and explained our findings. 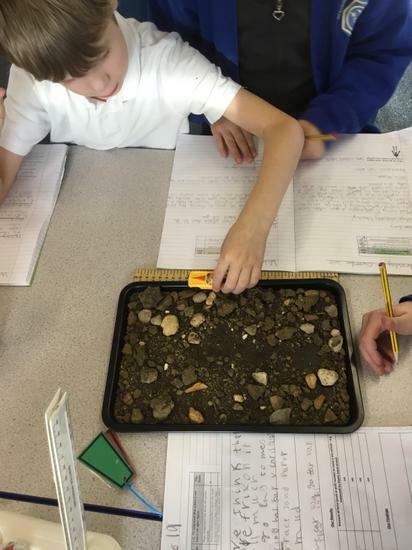 We found that the soil with larger rocks was more permable because the water had more air and space to run through. 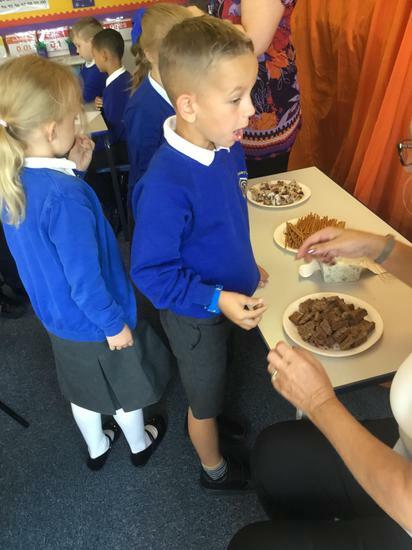 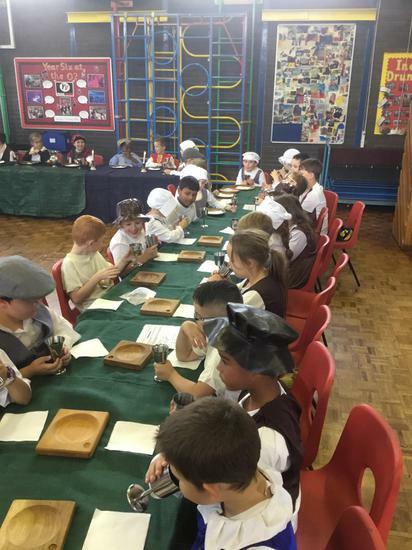 The children were fantastic scientists and made sure their tests were fair. 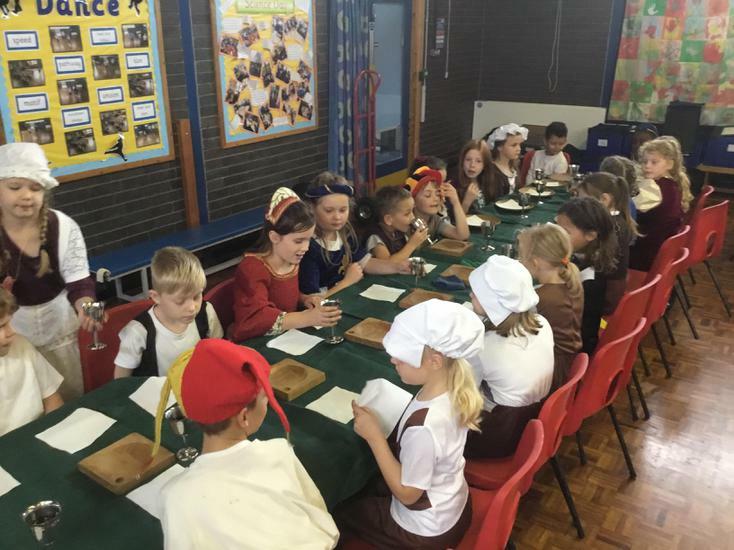 The children have come back to school excited and ready to learn! 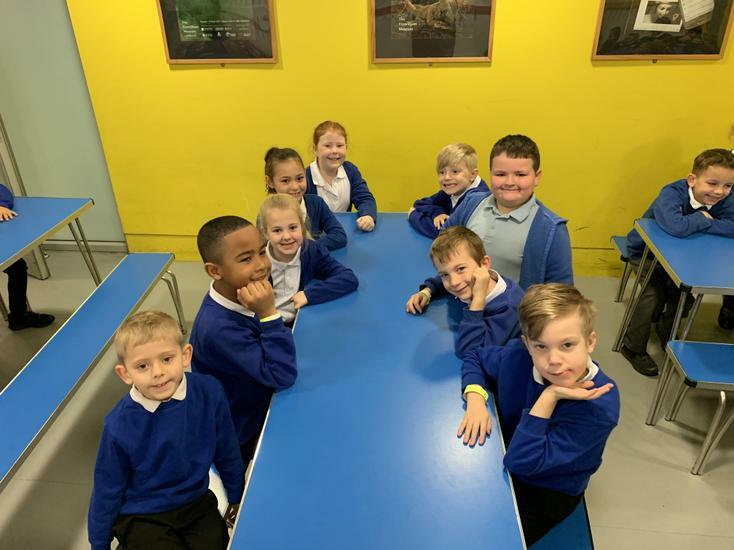 Please see the curriculum newsletter below which explains what the children will be learning this term in the classroom and in the ICE Zone. 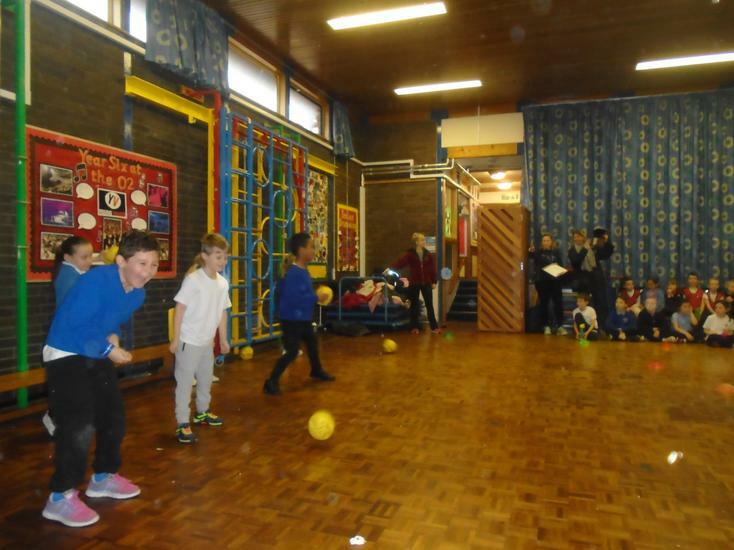 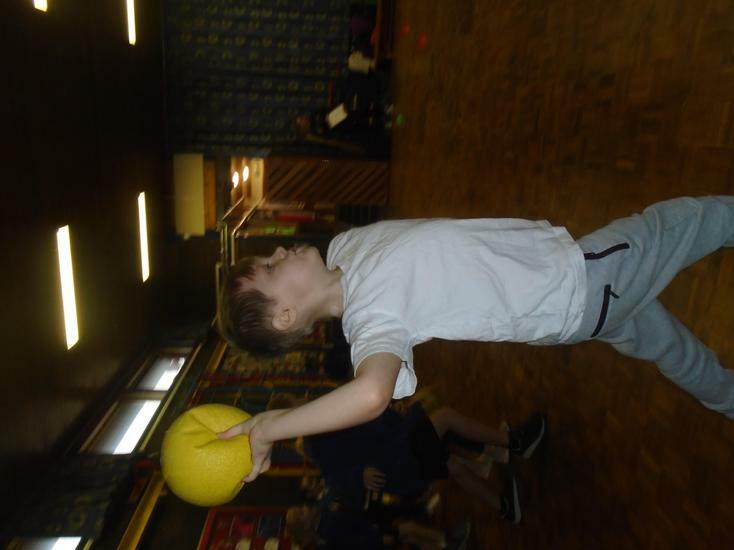 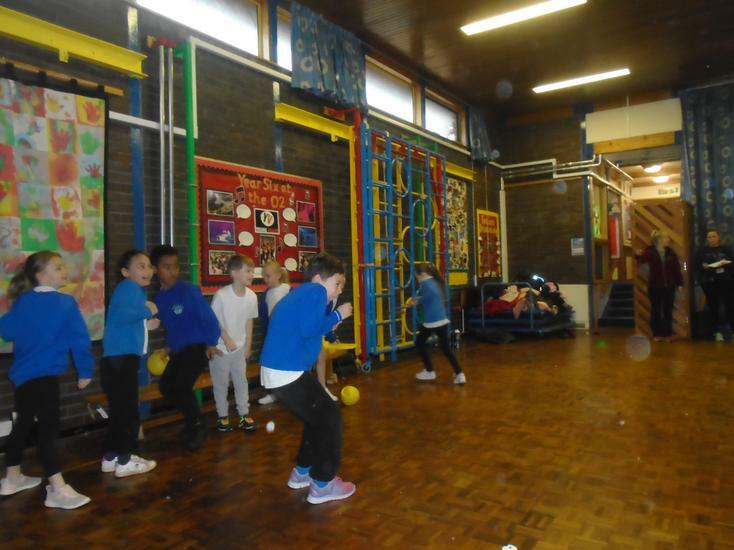 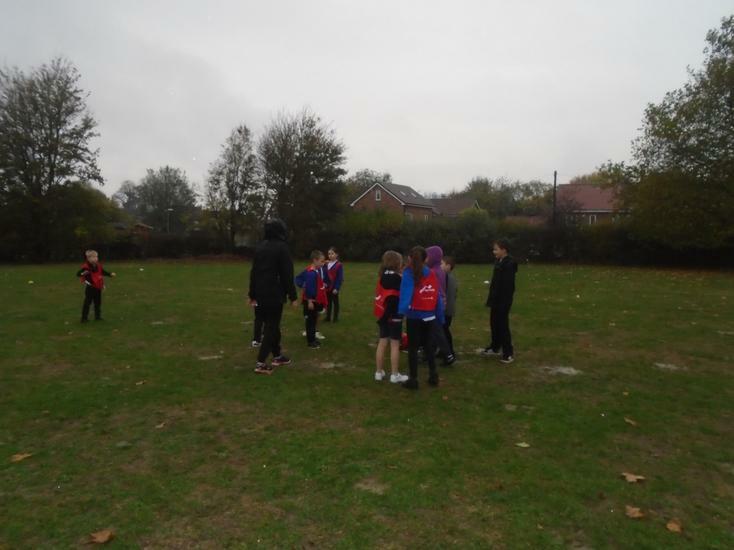 The first day were completed some team building games in the hall and the children were amazing! 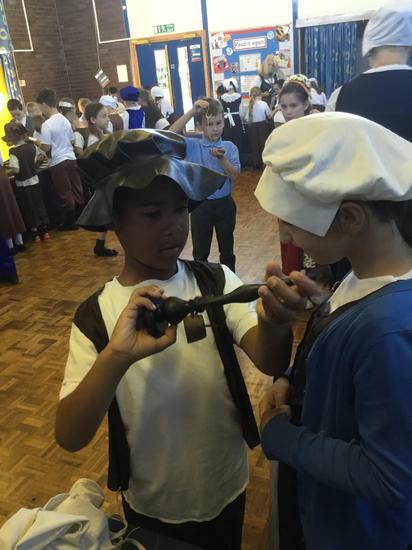 They supported and encouraged each other and communicated really well. 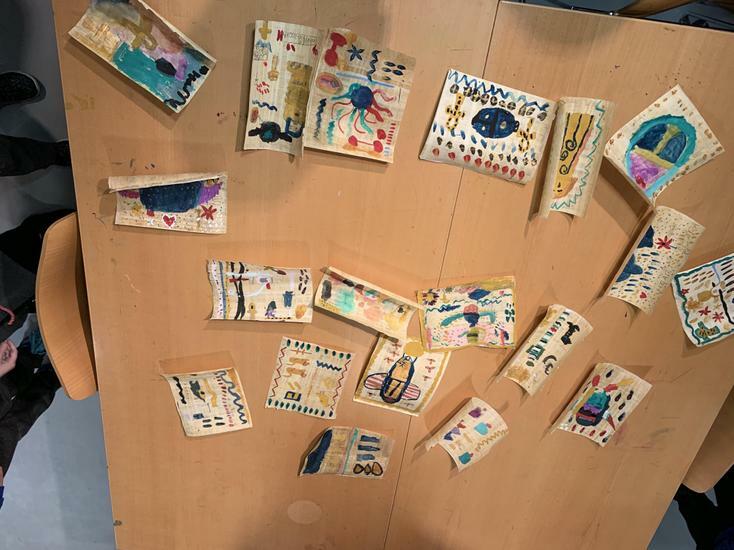 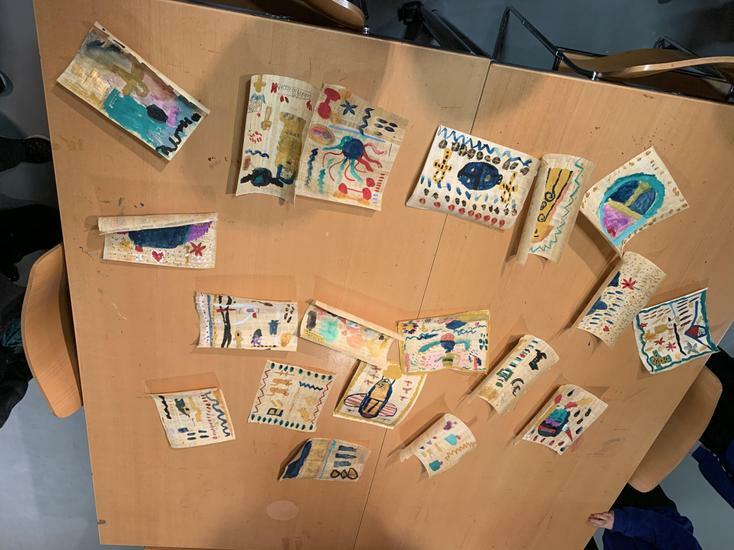 They also made some lovely art work. 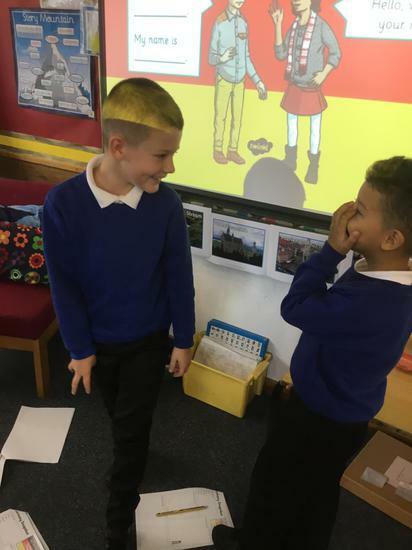 We have started looking at our new text in English 'Jemmy Button'. 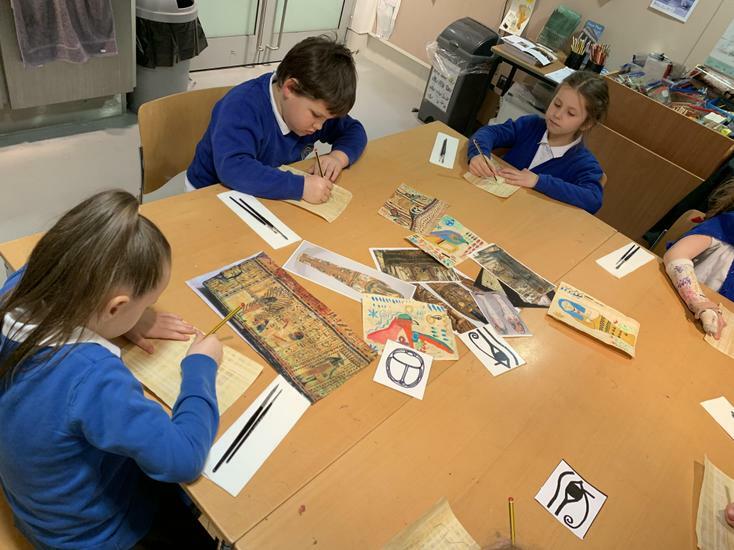 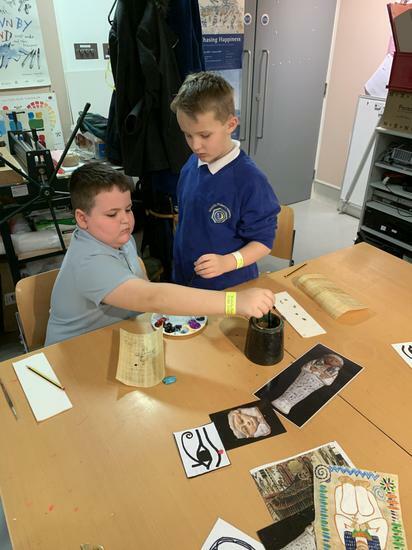 The children will be making inferences from the pictures, writing in role of the characters, letter writing and diary writing. 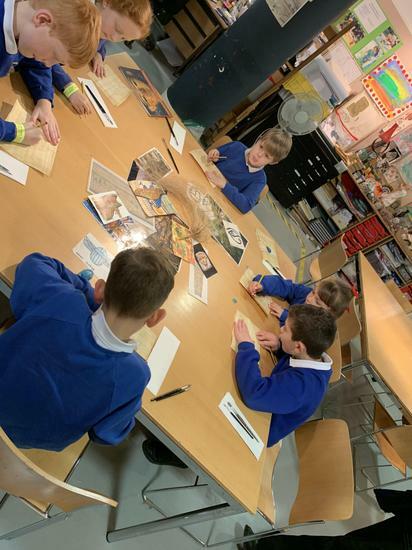 They are loving the story so far and are eager to see if their predictions are correct! 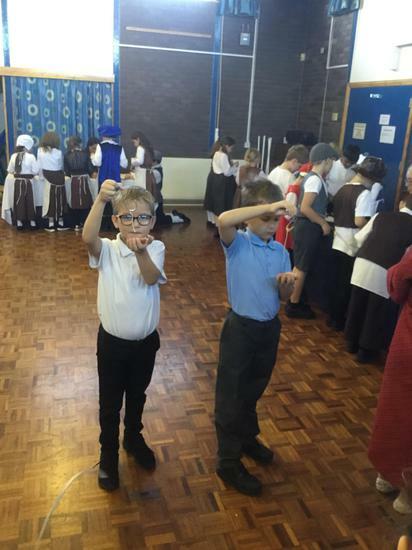 They also role played an image from the book where they were focusing on the characters feelings and emotions. 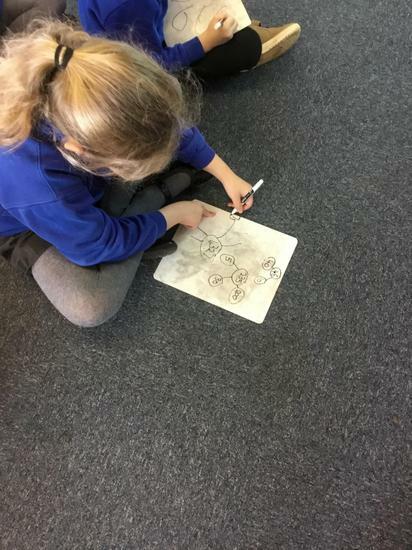 It was very interesting to see how each group interpreted the picture! 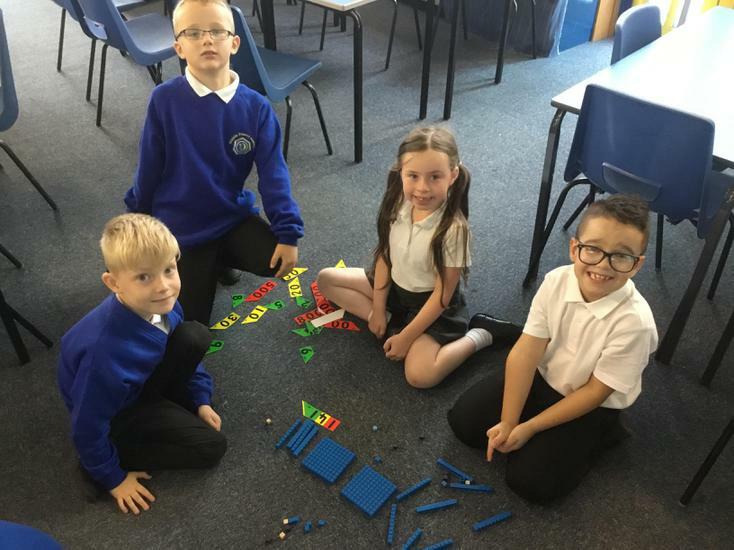 In Maths we are focusing on place value. 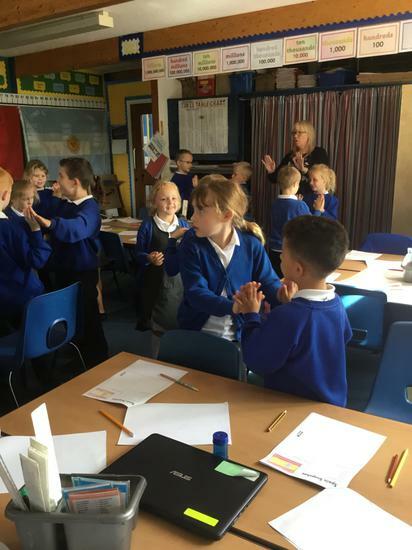 The children will be learning how to identify and represent numbers up to 1000. 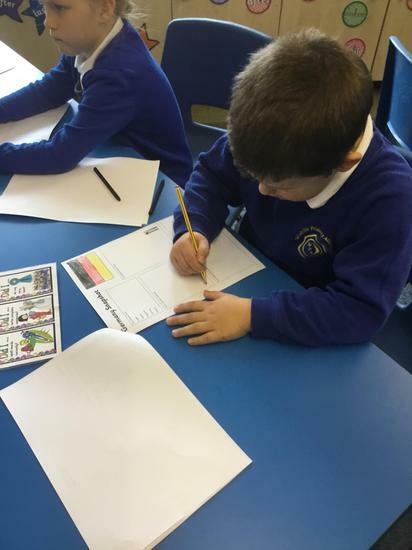 They will also compare and order numbers using a variety of resources. 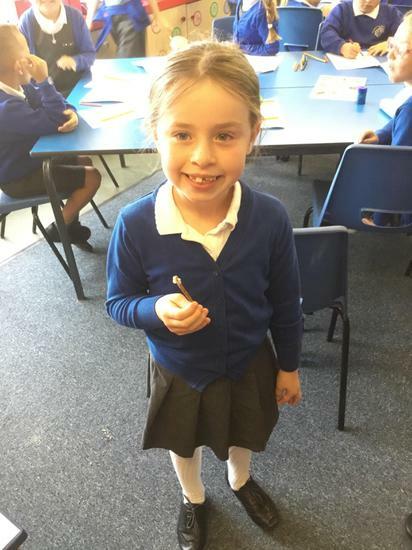 We have started learning about rocks in science! 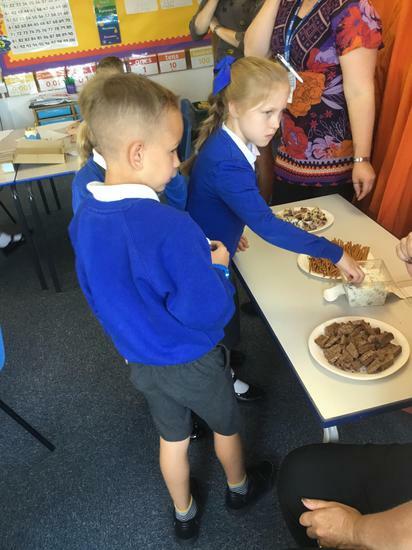 The children were eager to compare the rocks by looking at their properties and sorting them into groups. 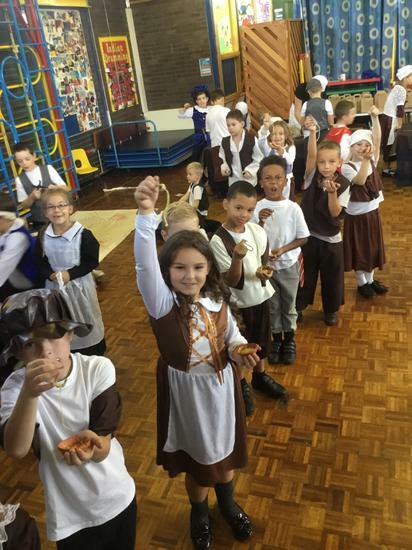 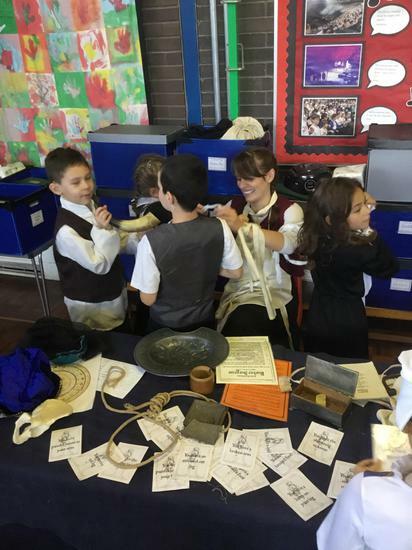 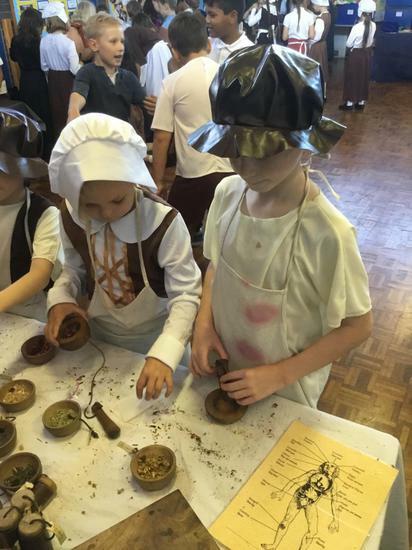 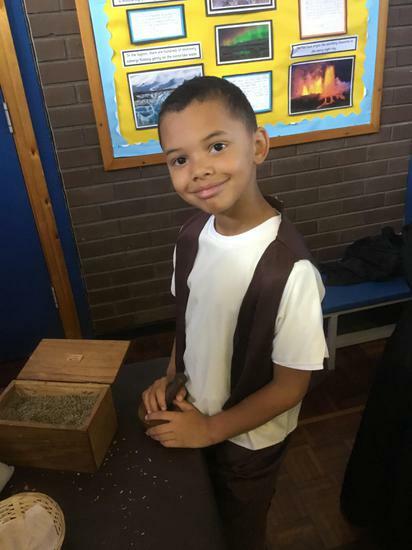 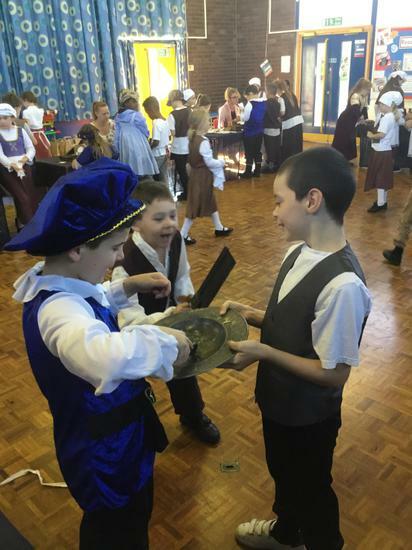 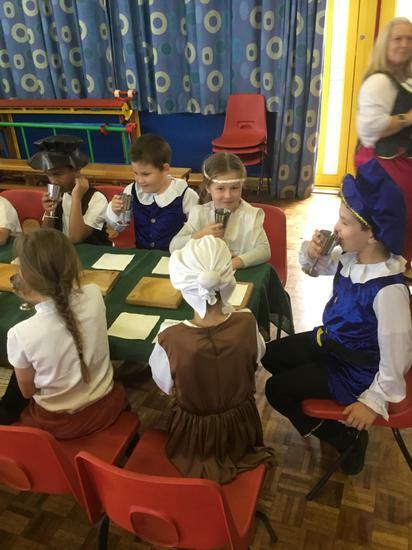 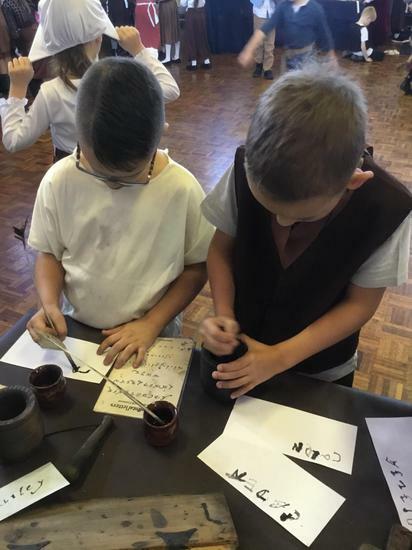 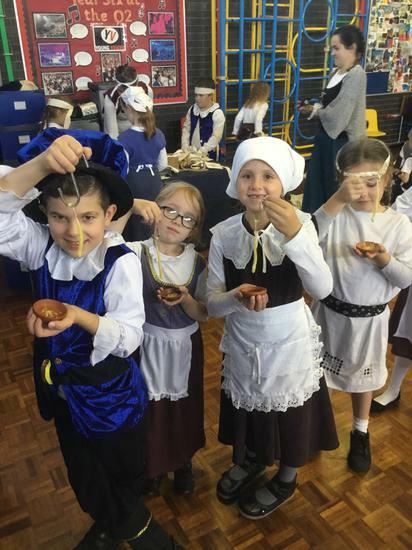 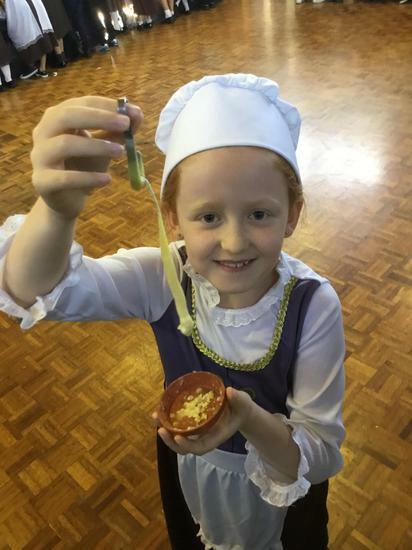 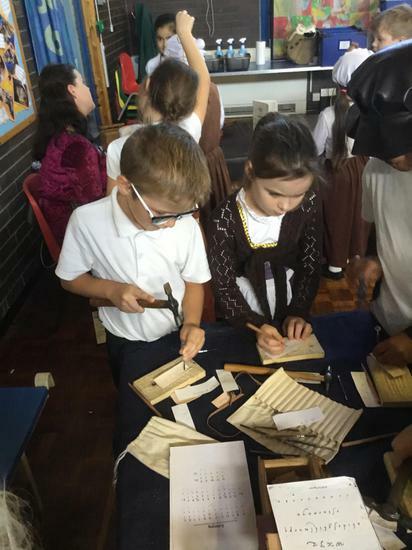 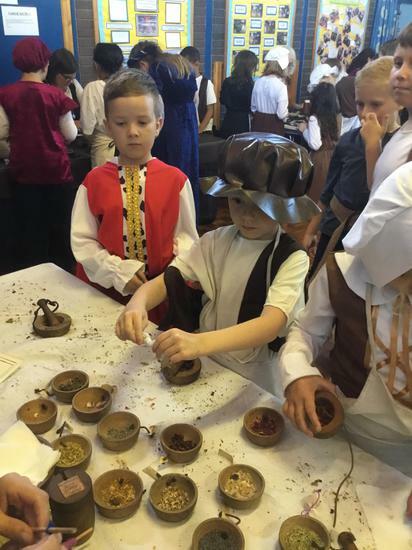 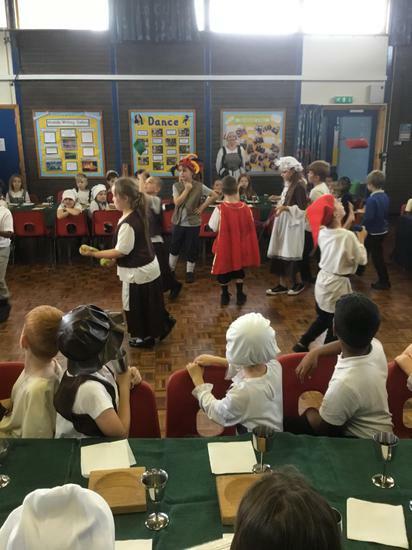 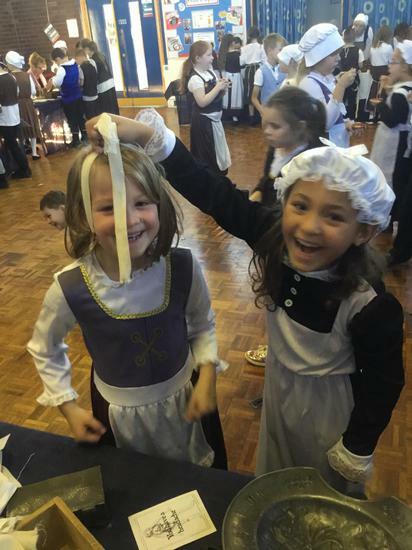 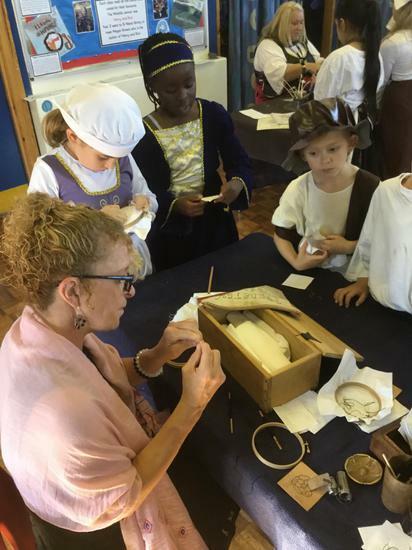 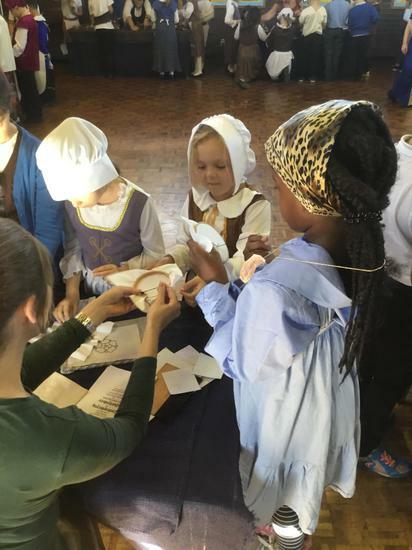 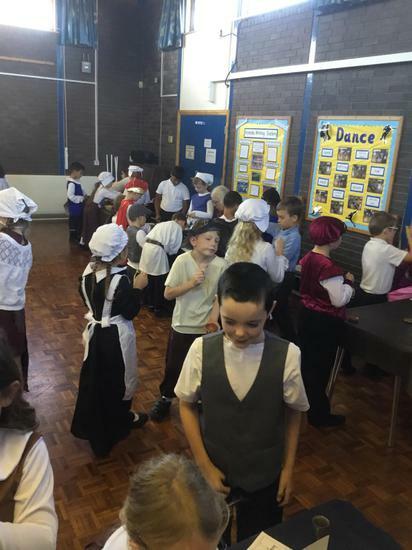 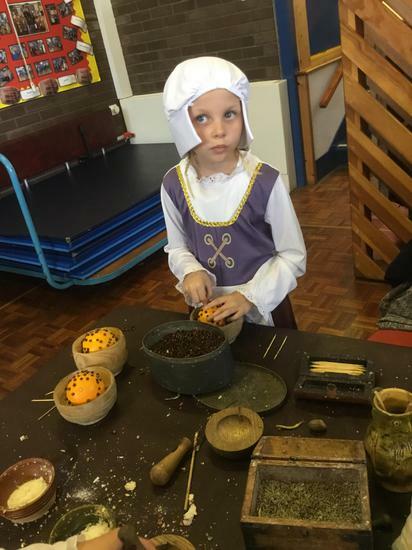 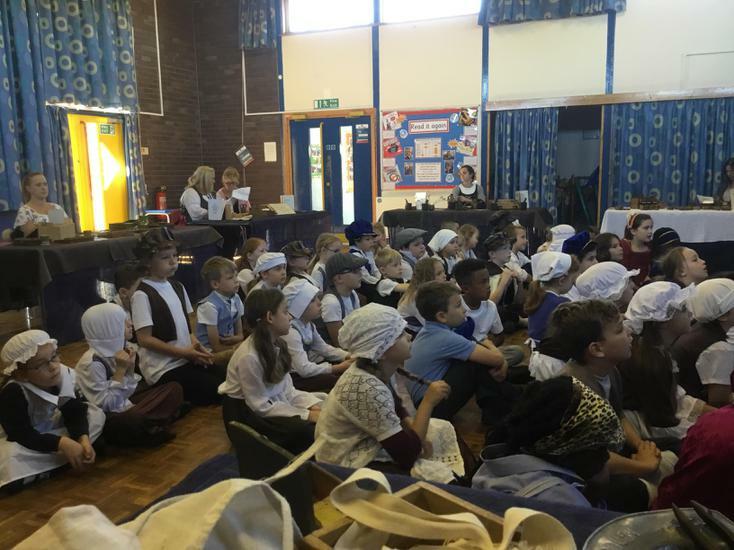 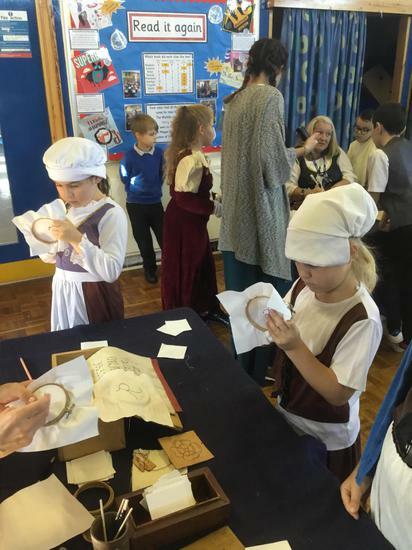 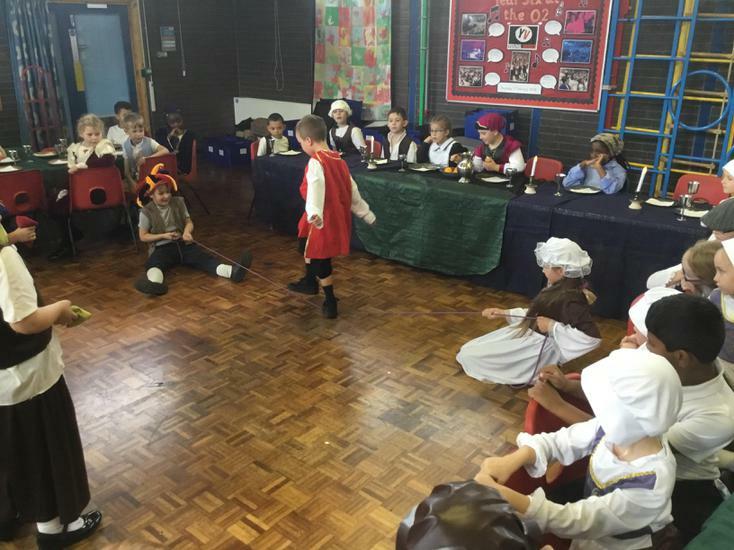 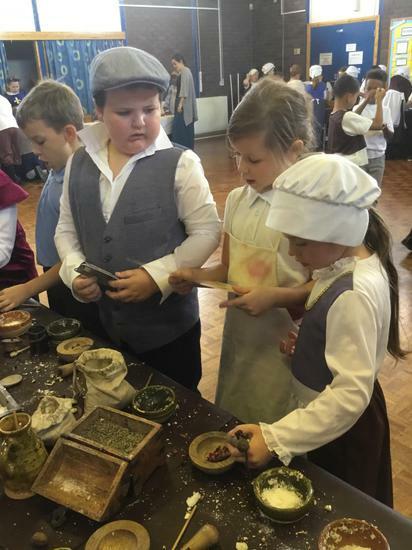 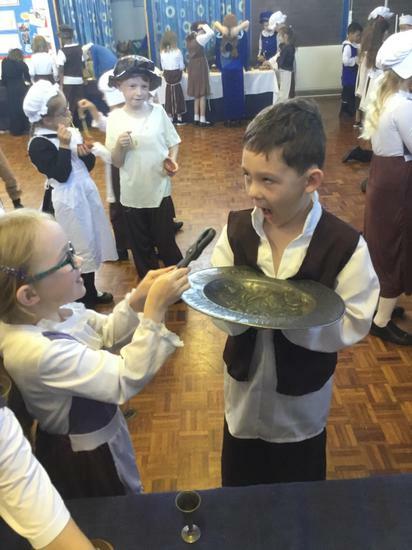 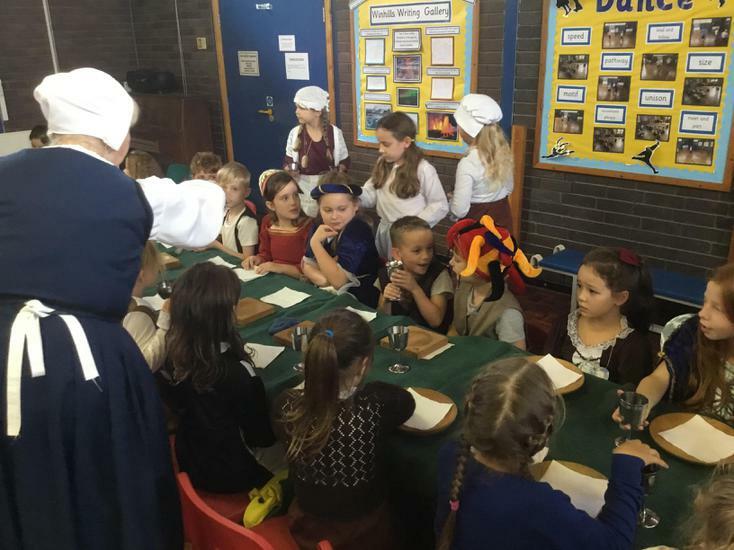 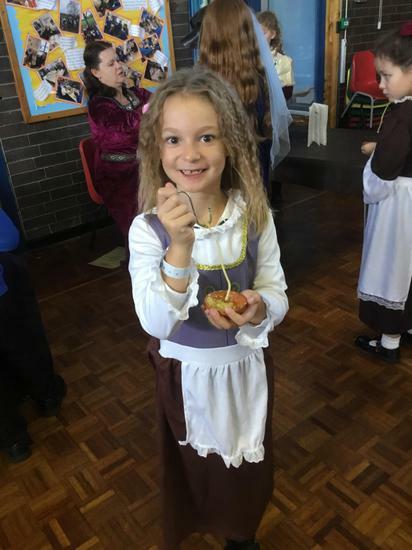 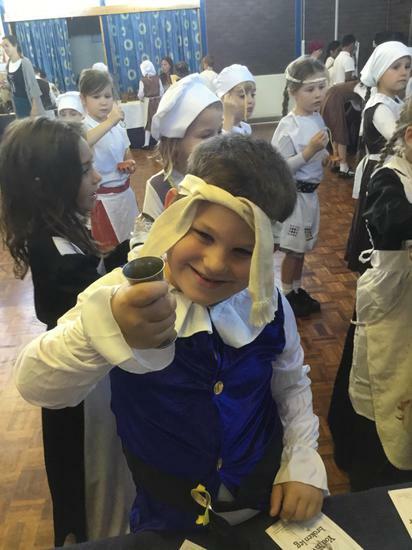 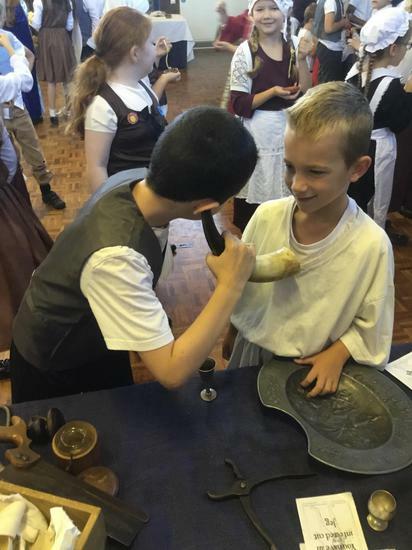 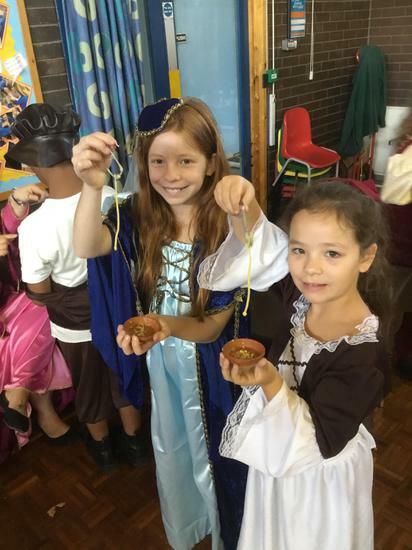 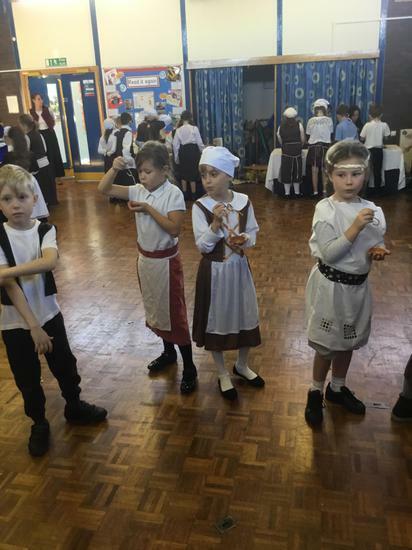 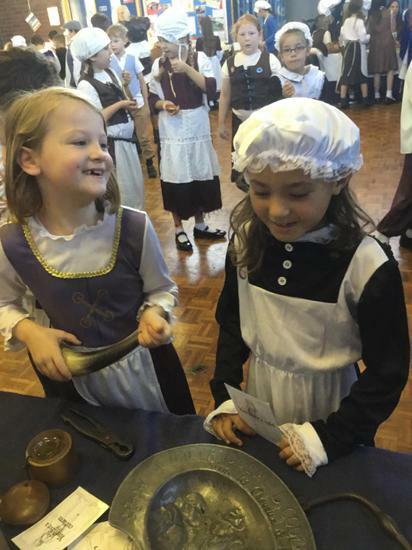 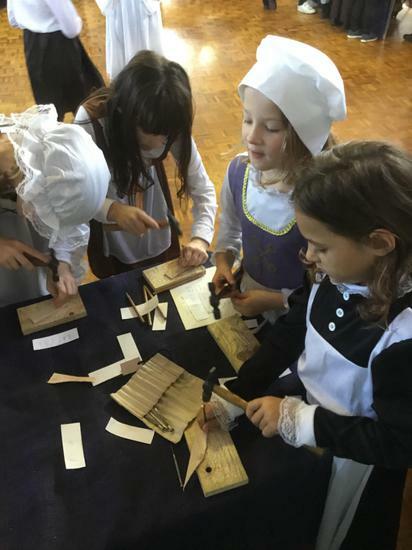 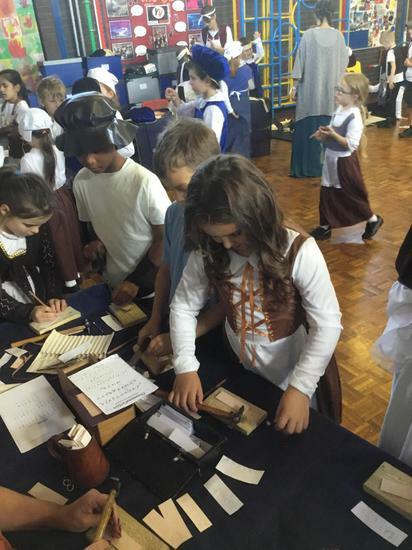 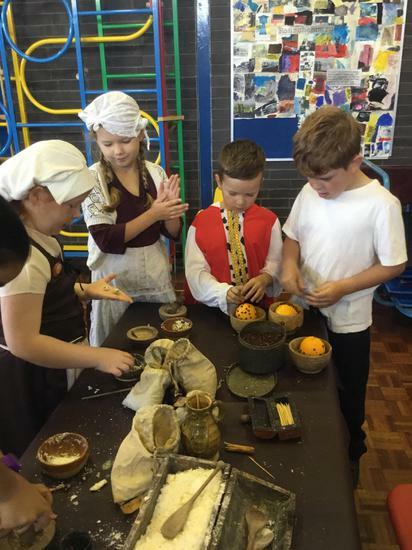 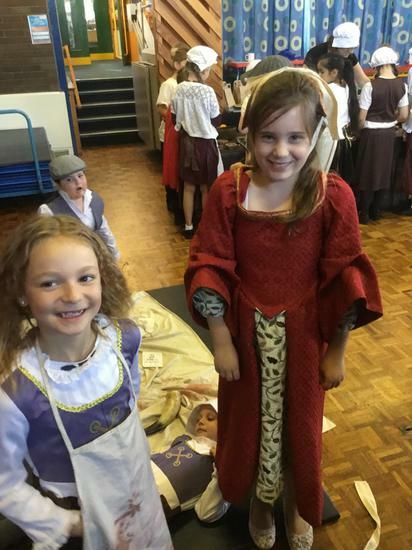 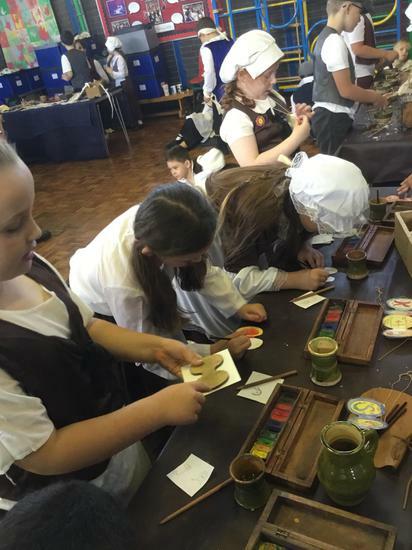 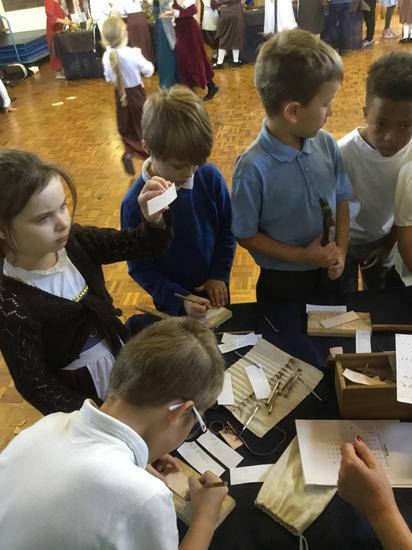 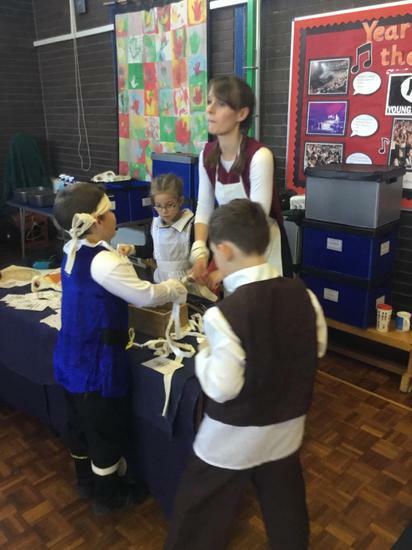 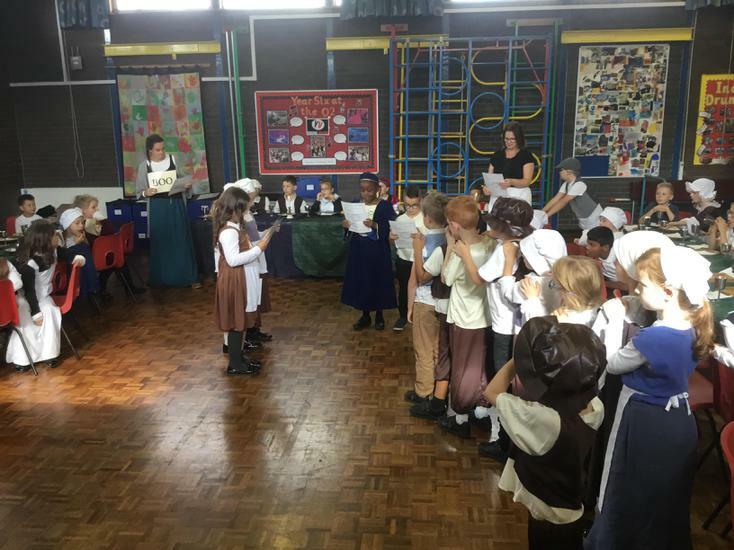 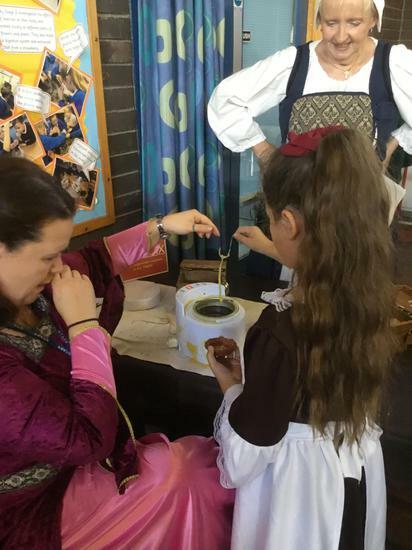 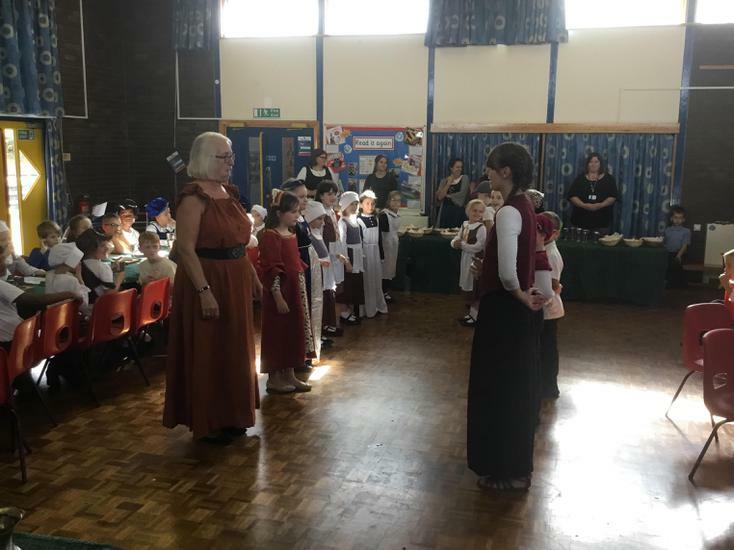 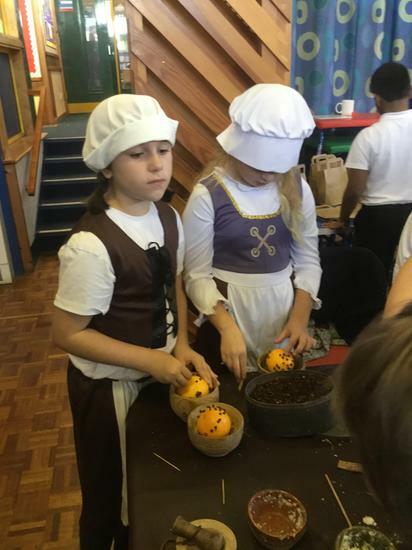 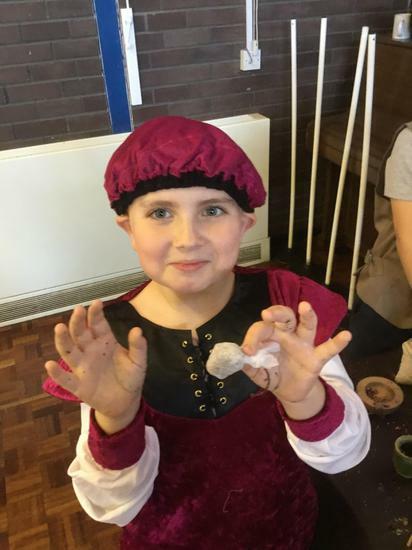 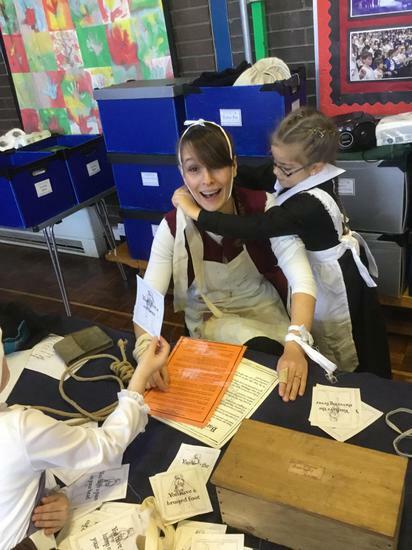 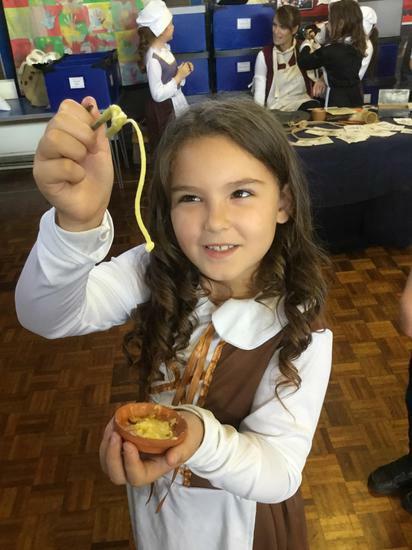 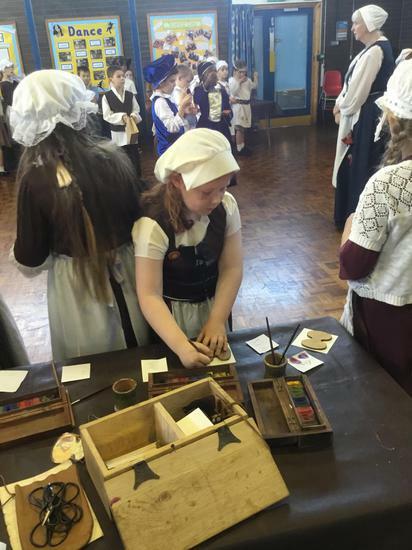 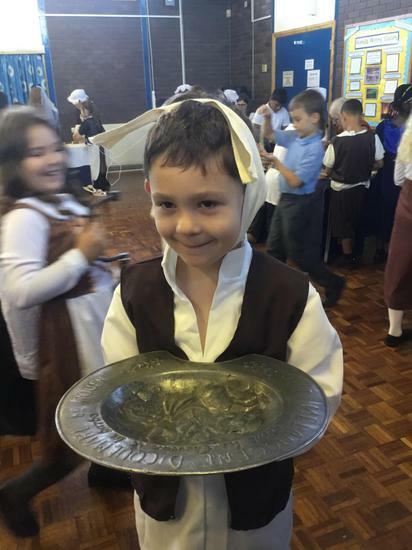 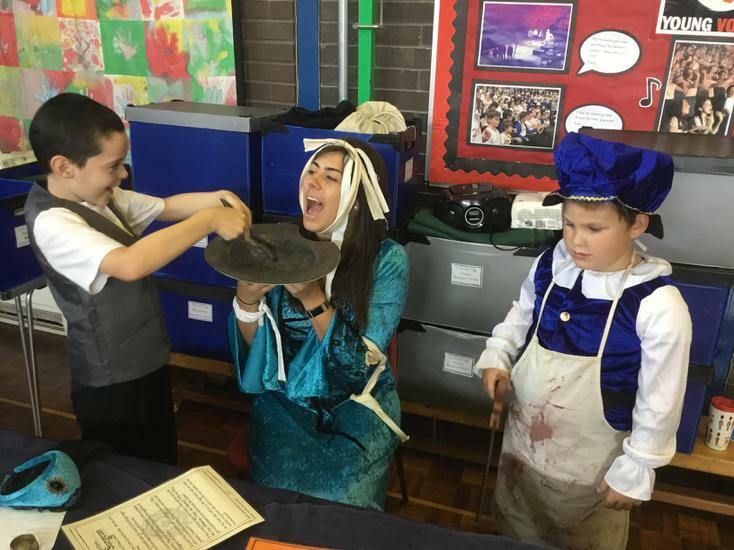 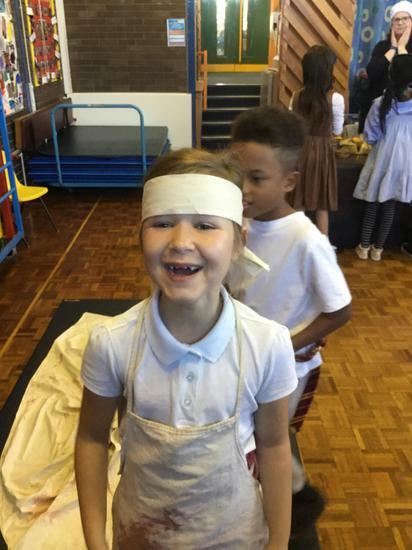 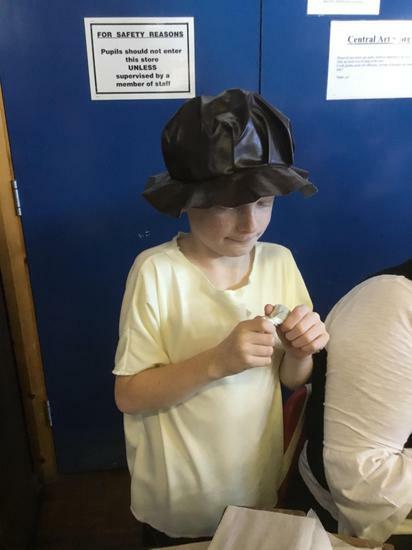 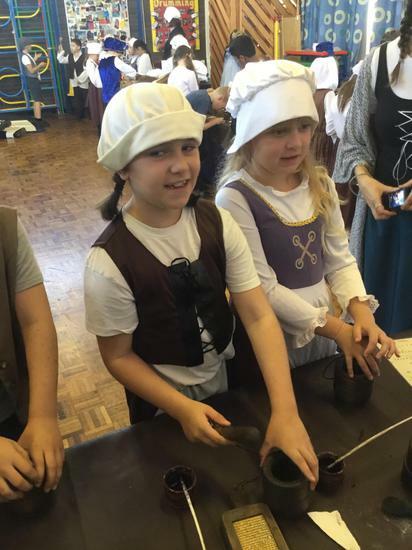 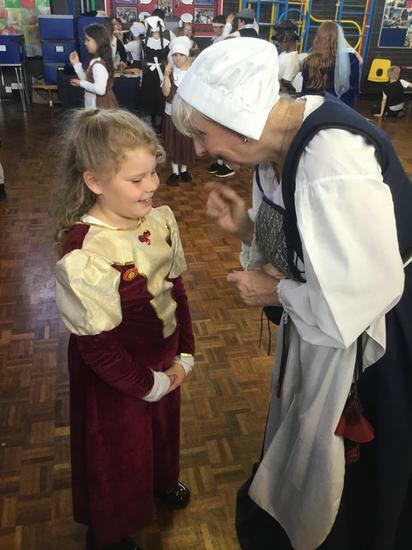 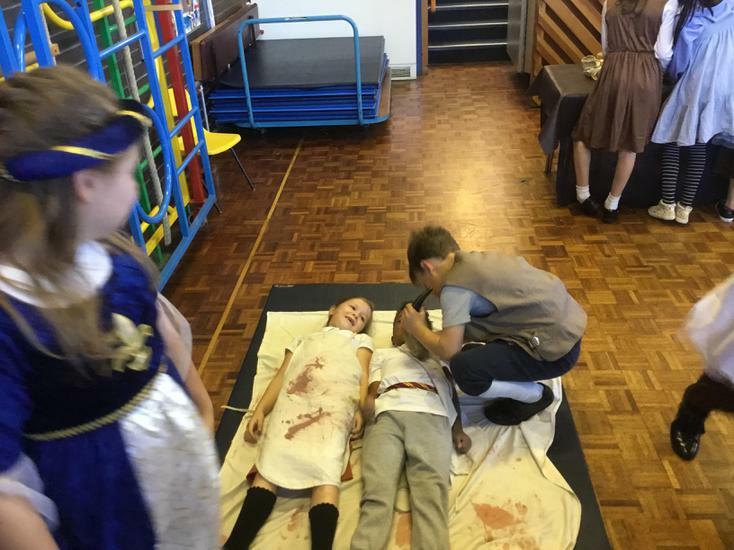 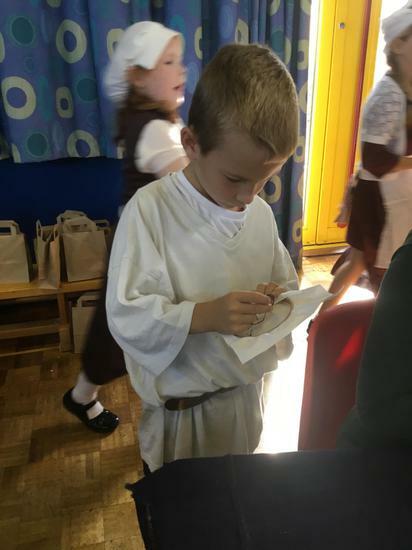 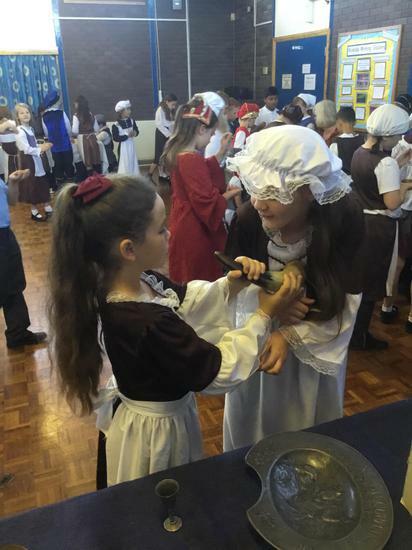 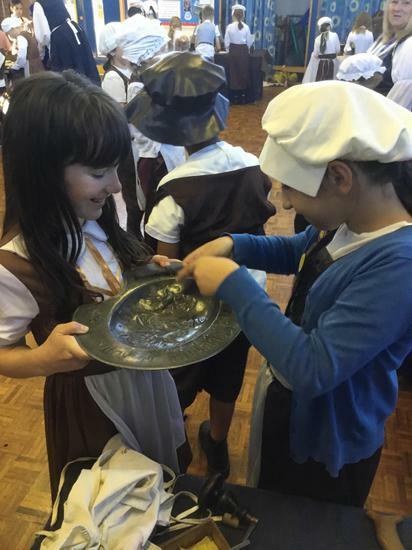 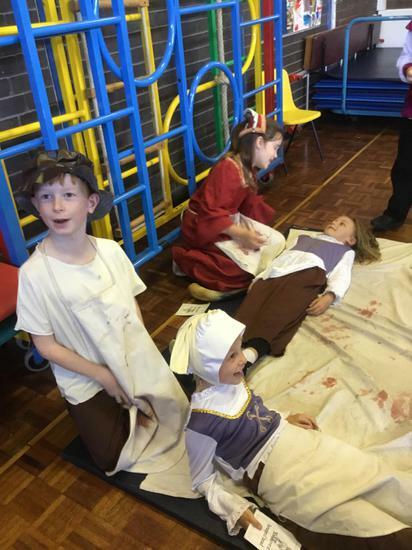 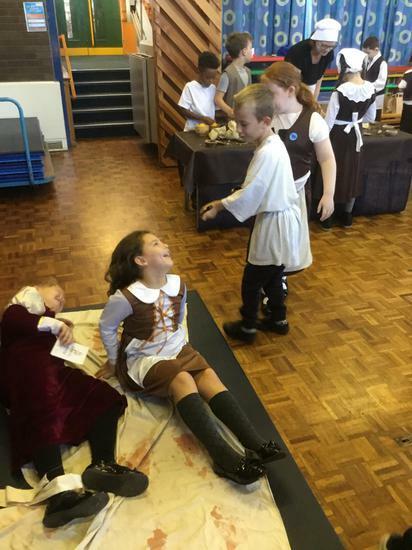 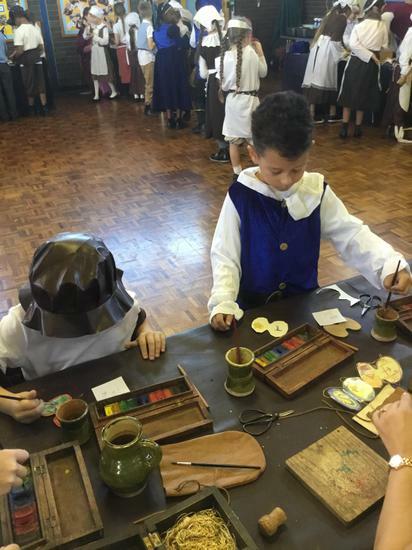 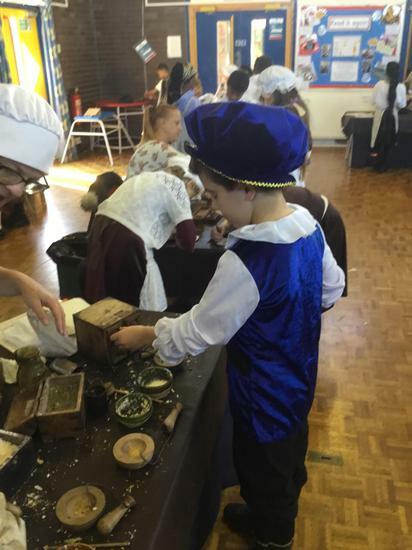 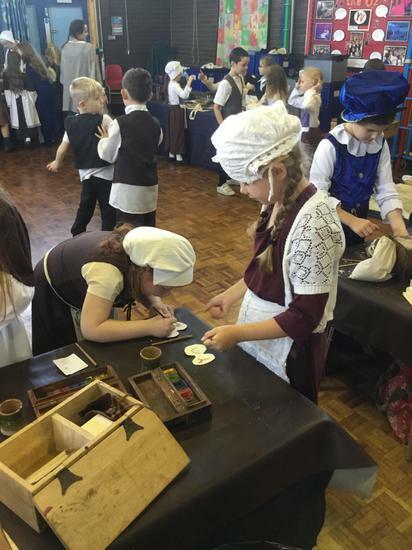 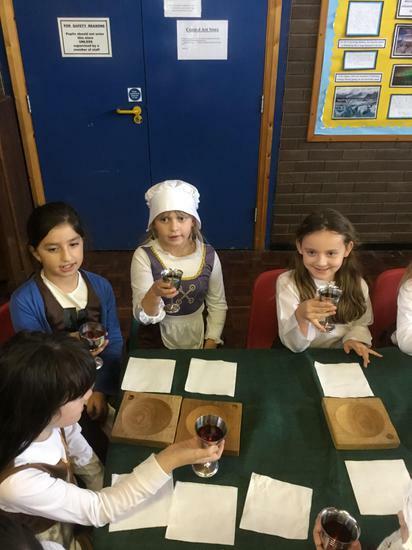 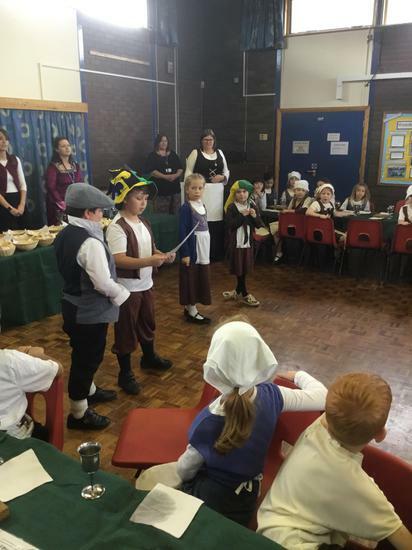 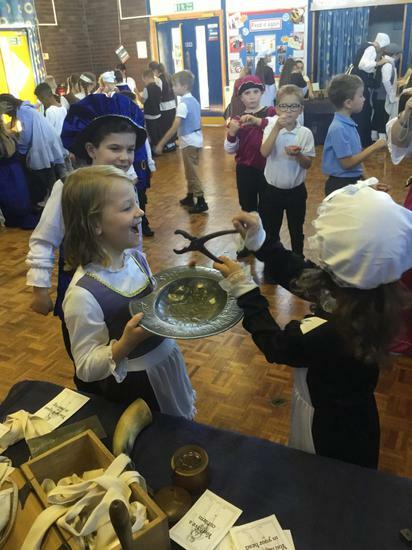 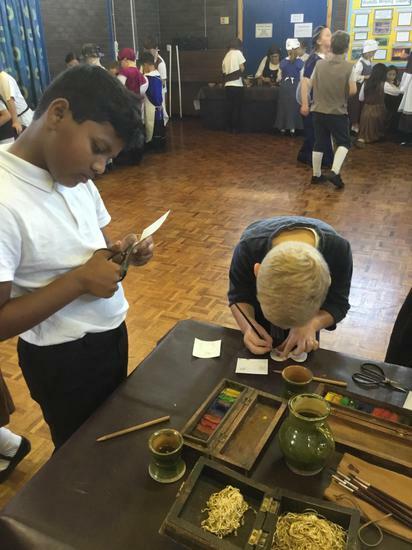 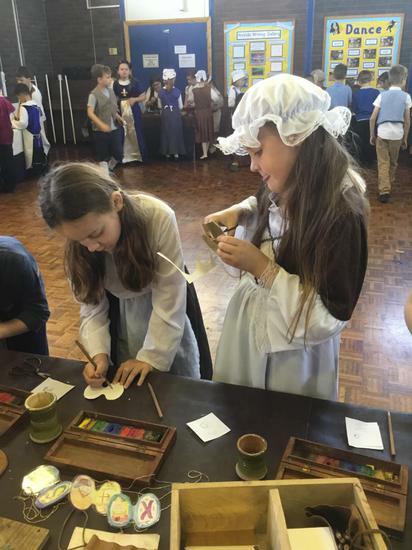 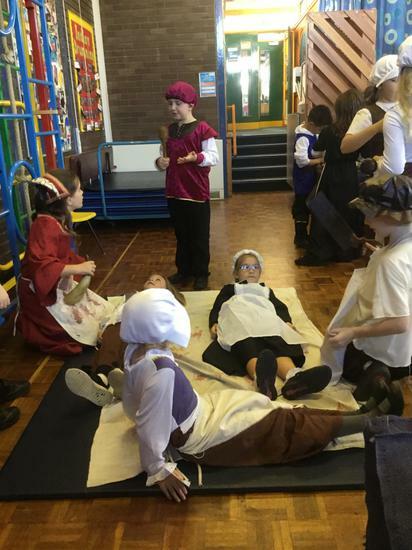 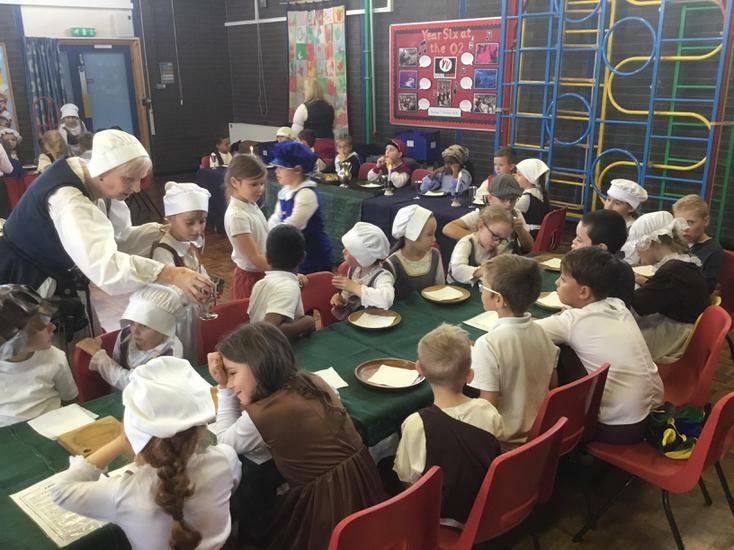 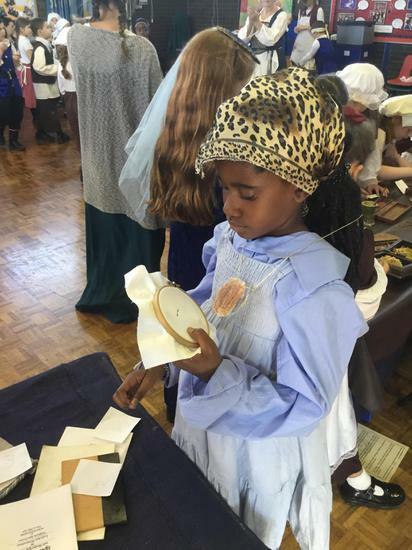 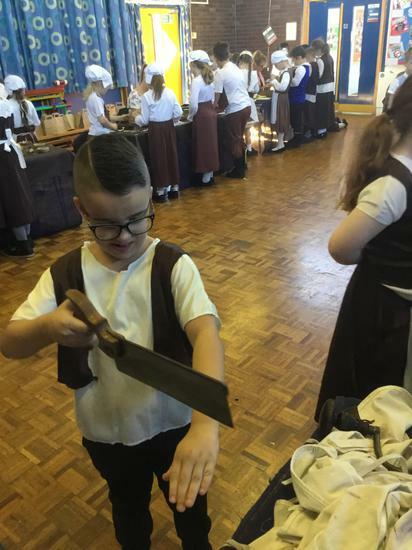 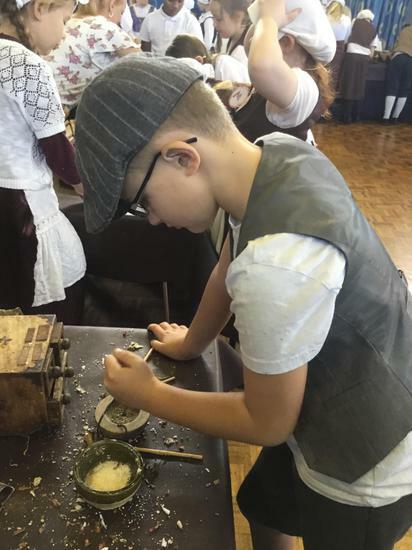 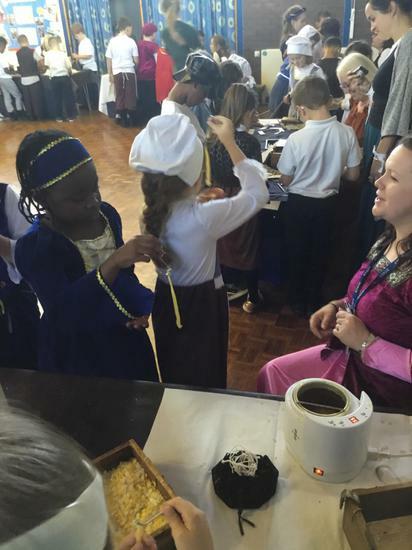 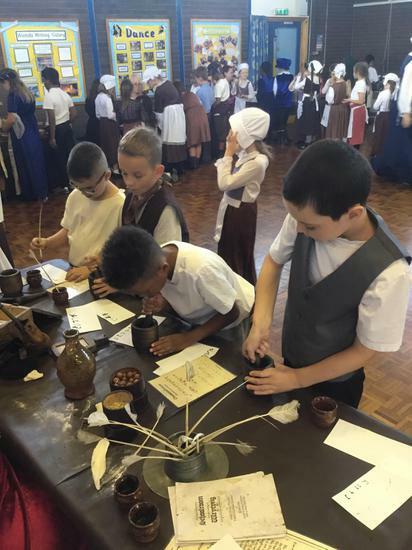 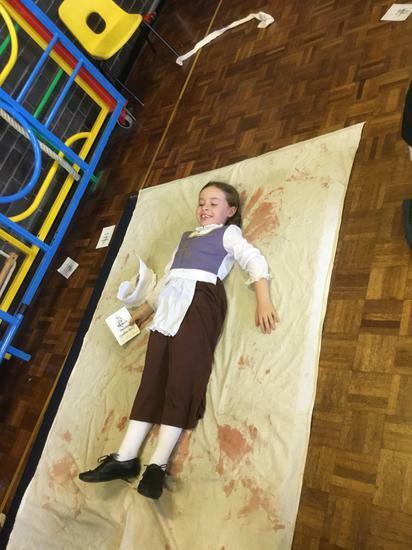 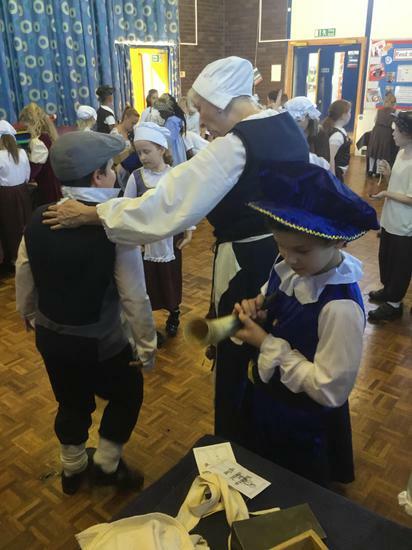 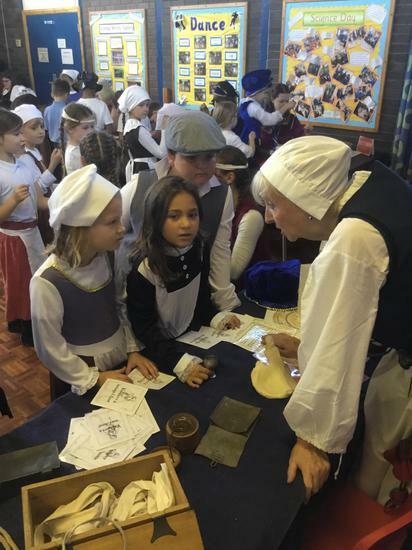 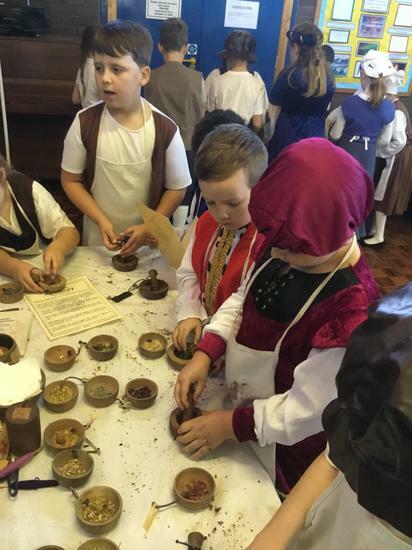 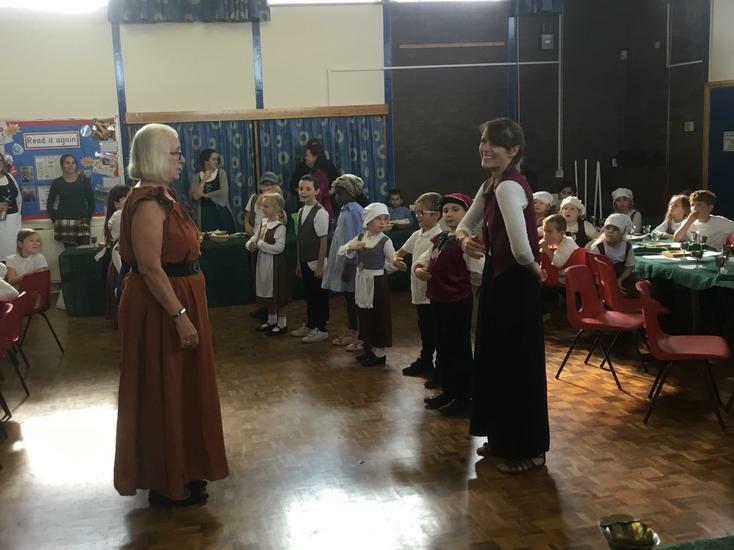 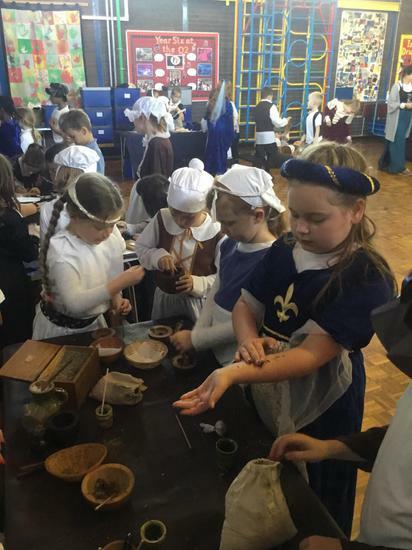 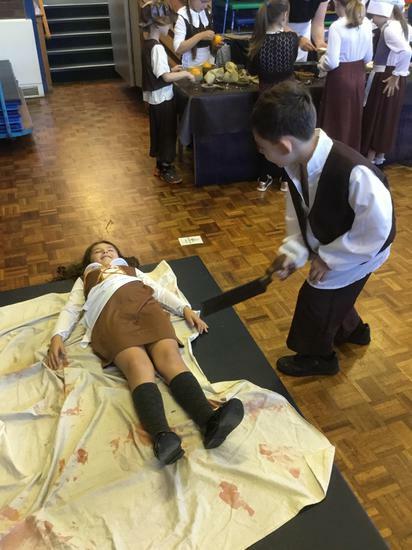 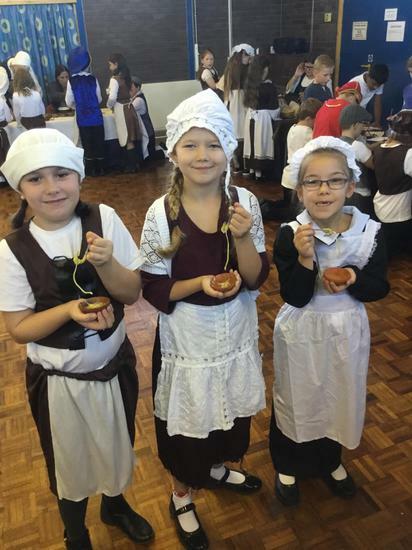 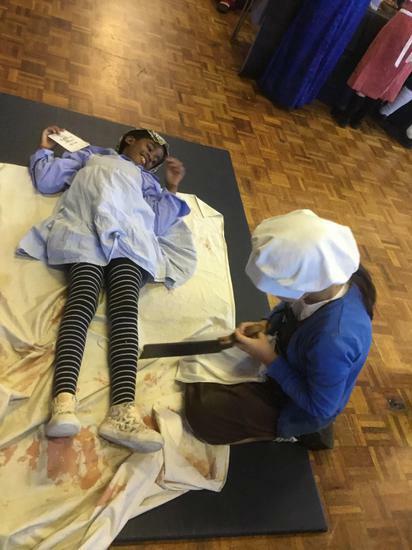 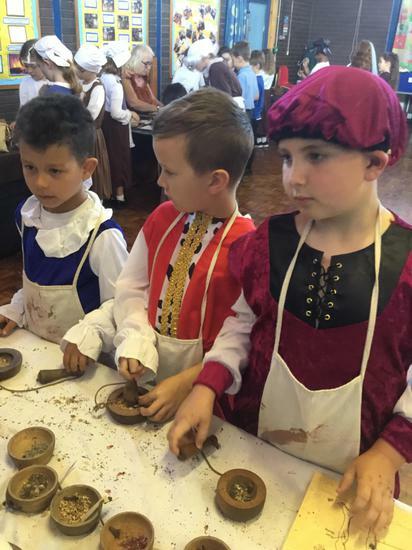 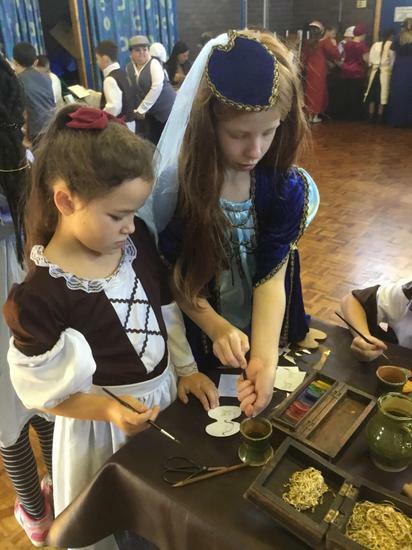 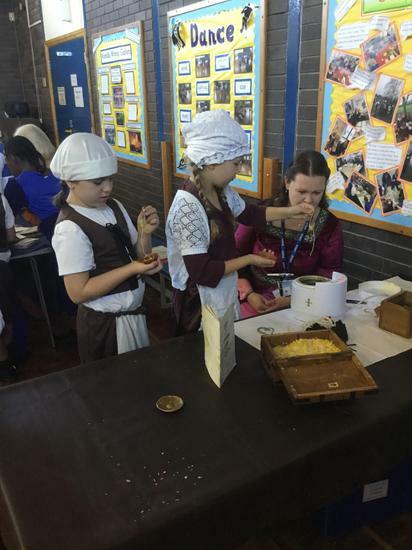 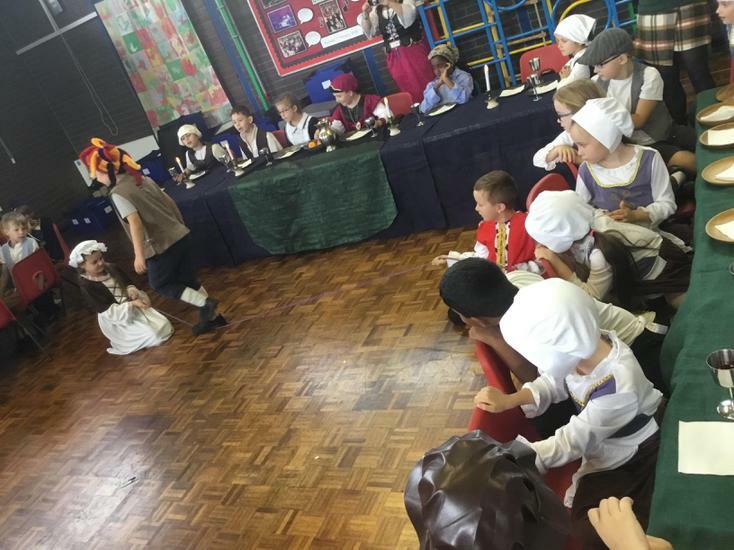 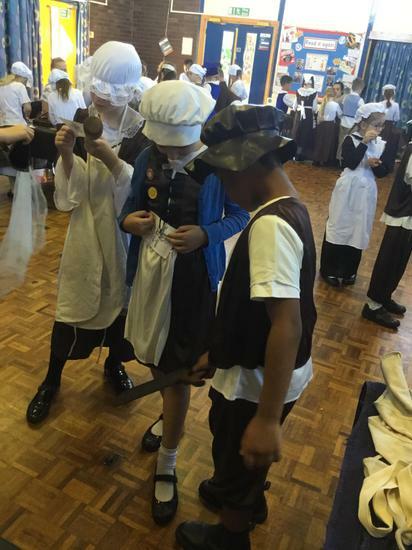 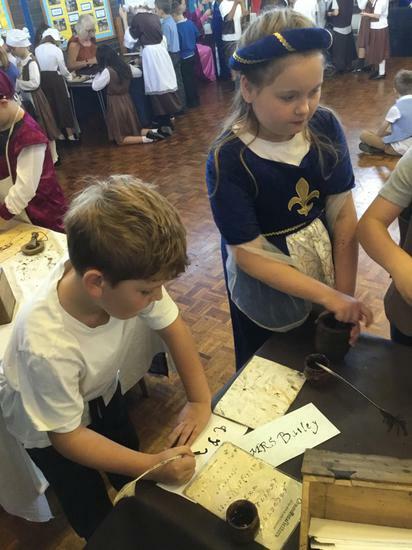 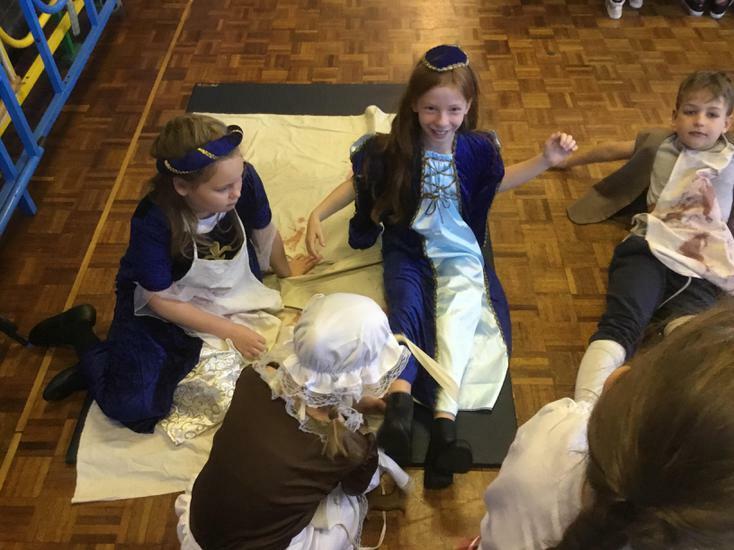 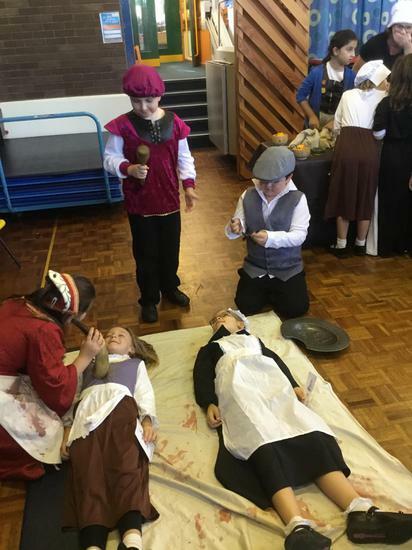 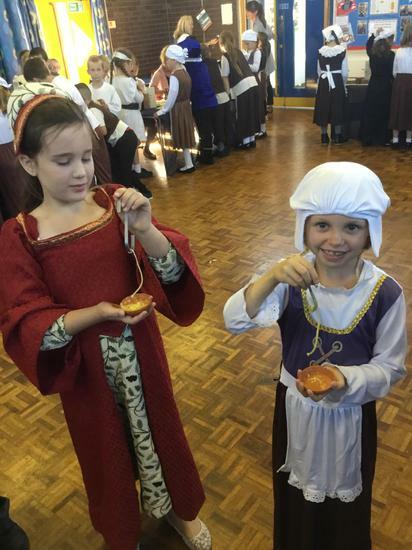 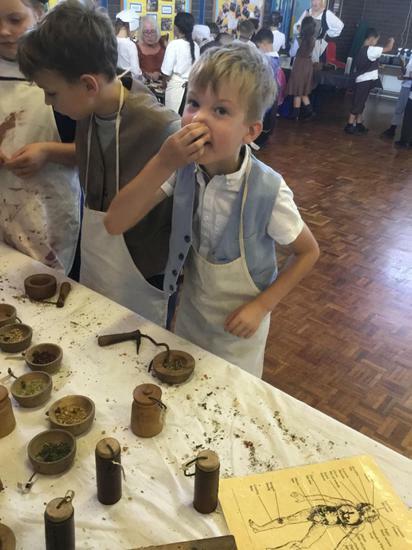 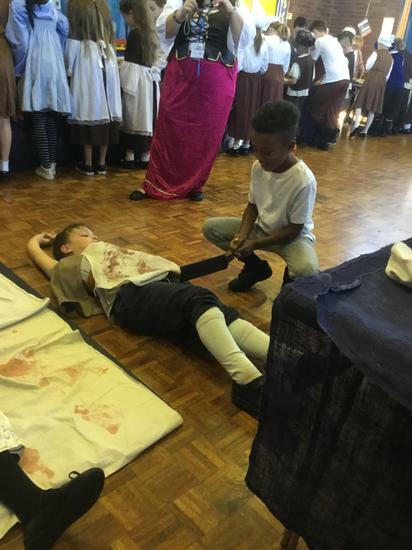 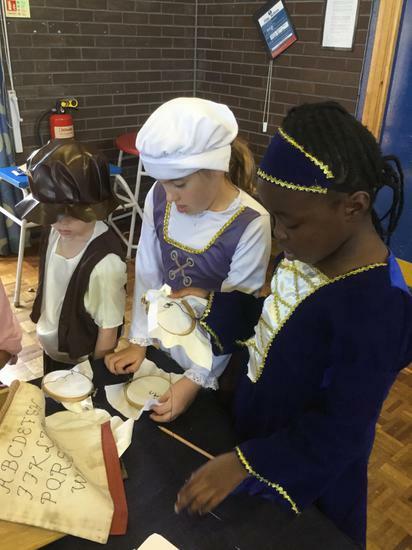 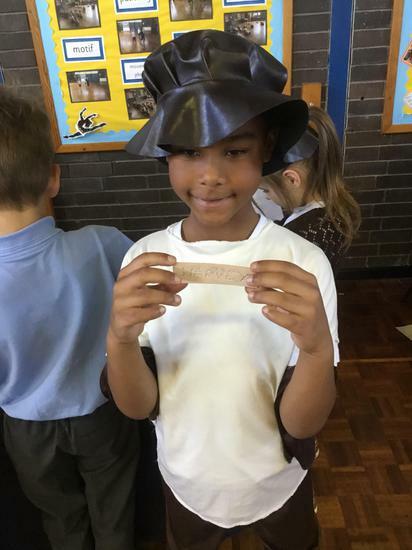 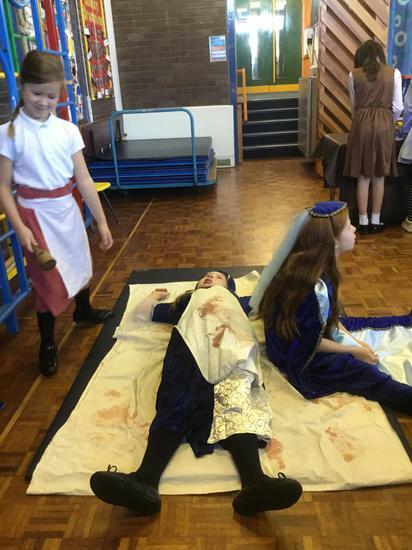 We had a very special 'History off the page' Tudor Day (see photos below) where we all dressed up and learnt about how the Tudors lived. 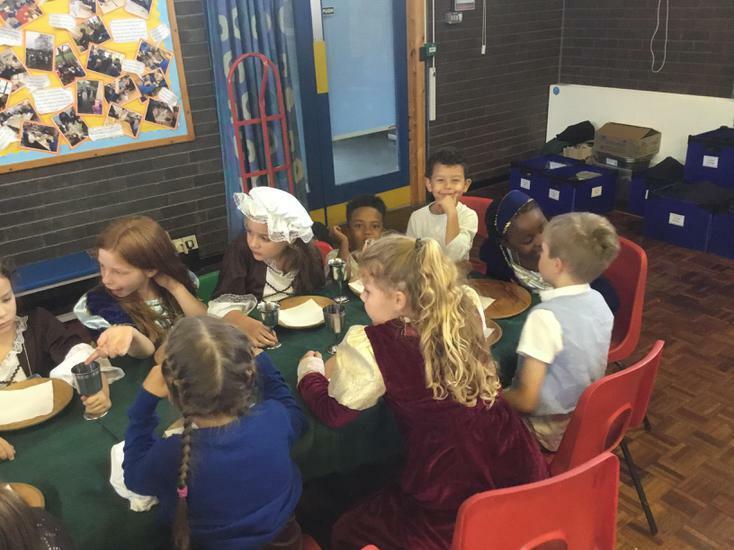 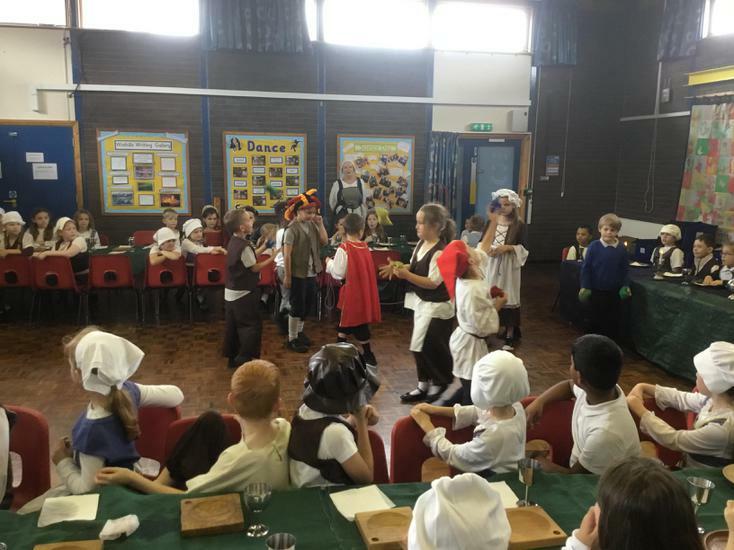 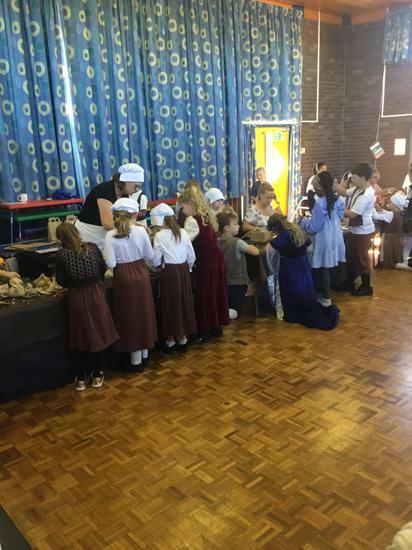 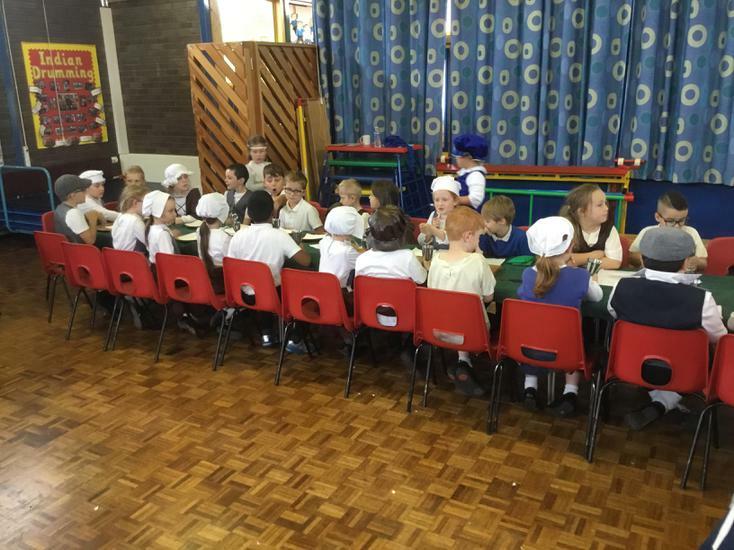 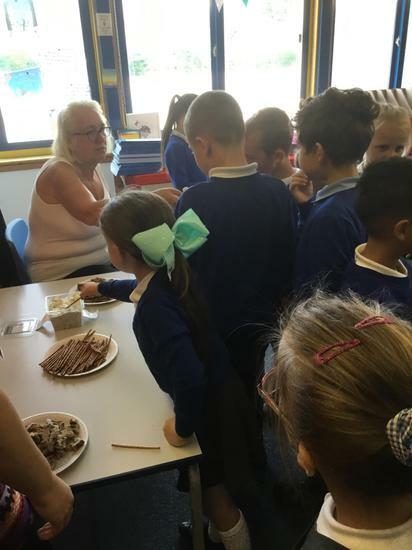 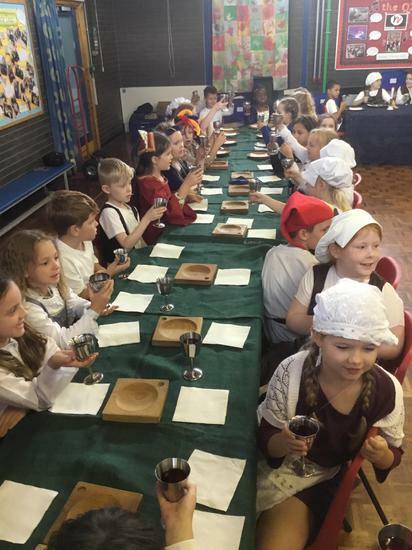 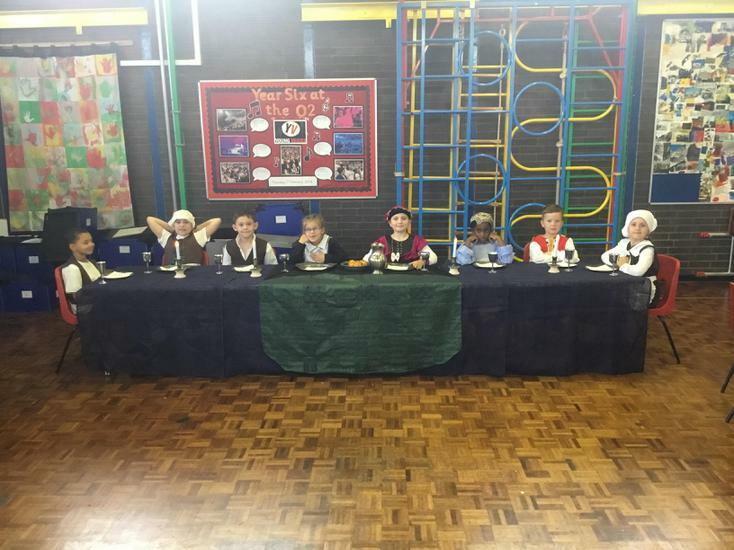 The children made fantastic items and had a lovely banquet feast! 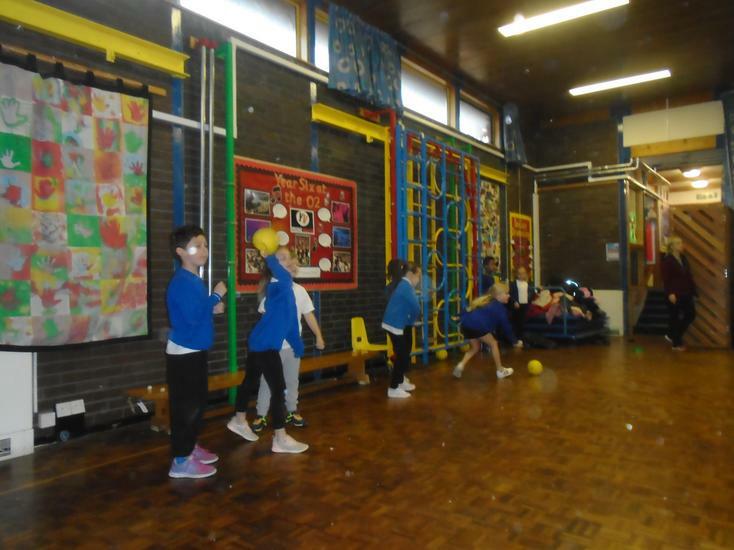 We completed the body coach fitness week and we got a shout out!